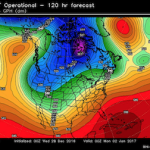 Why would the Rothschilds be so interested in owning the largest and most recognized weather modeling organization out there? 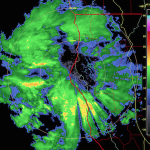 Why would E.L. Rothschild LLC wish to have the controlling interest in the world’s leading provider of interactive weather graphics and data services for television, web, and mobil? Because when you are involved in climate decimating geoengineering programs, you must also control the “forecast” models to cover your tracks. 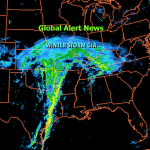 In the combination satellite/radar image below, two flows of moisture (one in the west, one in the east) are being orchestrated and utilized by the climate engineers in the attempt to cool large regions of the US with chemical ice nucleation processes. 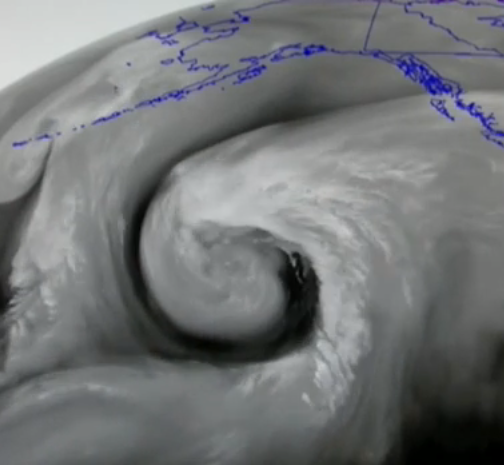 The "Pineapple Express" of warm air and moisture is flowing in from the Pacific in the west. 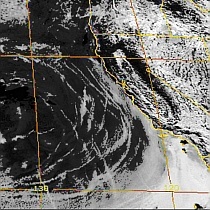 This flow of warm moisture was the beginning of "Winter Storm Iras". 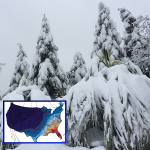 In the East, an anomalous flow of warm air and moisture from the warm waters southeast of Florida is pushed up the eastern seaboard, this warm flow was the fuel for the final chapter of "Winter Storm Helena". 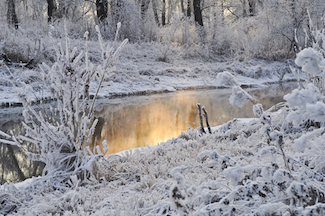 How can such warm sources of moisture "change over" to snow and cold? Welcome to climate engineering and chemical ice nucleation. The radar map below was captured at the same approximate time as the combination satellite/radar image above. When comparing these two images, the following question should be considered: how does a warm flow of air and moisture originating from warm oceans south of Cuba suddenly "change over to snow"? 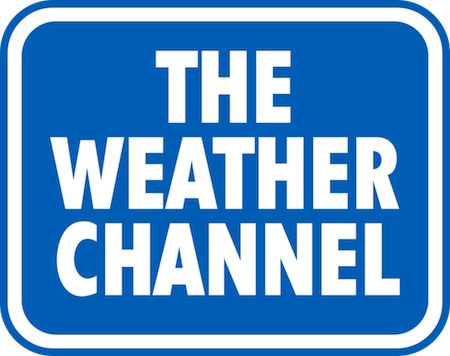 The "change over to snow" term is now commonly used by power structure owned "The Weather Channel" paid actors (and other power structure owned sources of weather "forecasting"). 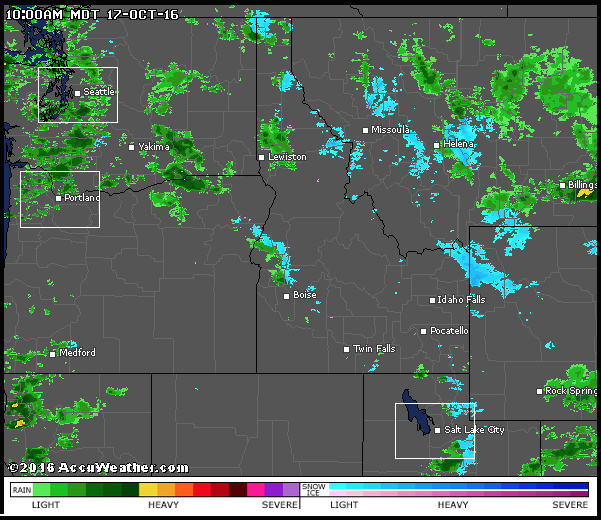 Looking closely at the above radar map, some rain cells (unfrozen precipitation) are still visible near the eastern fringes of the chemically nucleated snow zones. 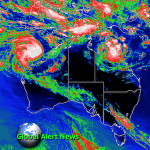 The next combination satellite/radar map below was taken approximately 20 hours after the similar image shown earlier in this article. 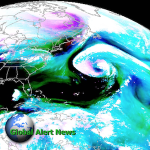 The flow of warm moisture from south of Cuba to Maine and beyond was still fueling "Winter Storm Helena". 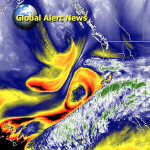 In the west, the "Pineapple Express" was ramping up to fuel "Winter Storm Iras". 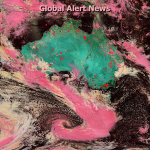 As the ongoing global climate engineering assault continues to be ramped up, satellite and radar images are becoming increasingly bizarre. 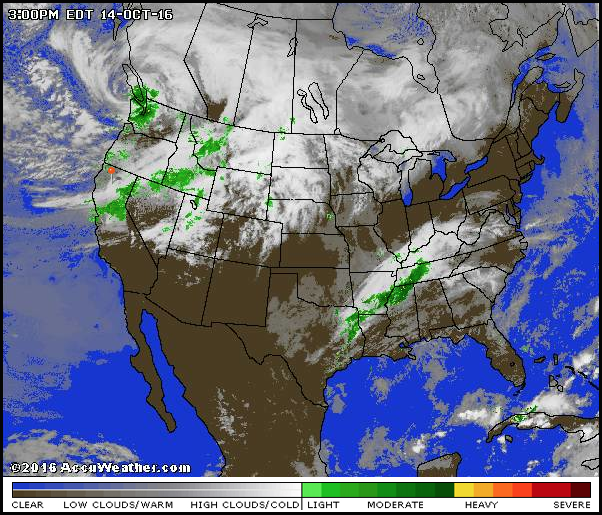 Note that in the image above the entire North American continent is completely covered with a canopy of clouds and atmospheric aerosols. The same is true of mainland Mexico and almost all of the Gulf of Mexico. 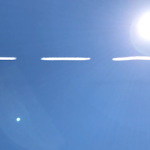 This is "solar radiation management" in action. 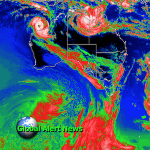 The satellite map below must be compared with the satellite/radar map directly above. 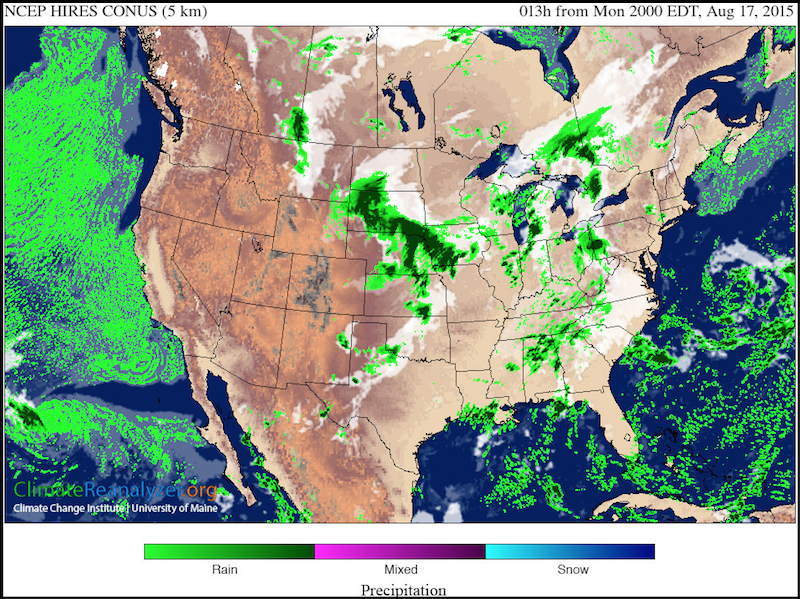 As already stated, the warm flow of moisture being utilized for "Winter Storm Iras" is flowing in from the warm Pacific. Consider that there is virtually no snow of frozen precipitation visible in California, even in extremely high mountain locations with elevations well over 10,000 feet. Why not? Because of the very warm sources of this moisture. The day before the image below was captured, it snowed at the valley floor in Redding, California. Redding is at an elevation that is just above sea level at 500 feet. Then, the next day, as shown in the image below, no snow anywhere in the state including at elevations of far over 10,000 feet. A final note on the map above to consider, snow is shown falling in southern Mississippi, and only rain at the top of the Sierra Nevada mountain range. What is wrong with this picture? 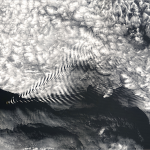 The short satellite animation below was taken approximately 8 hours after the radar image directly above. 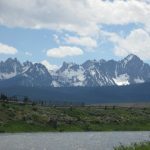 The beginning of chemical ice nucleation processes were beginning to appear in California at the top of the Sierra Nevada mountain range. Further inland, the warm flow of rain can be seen "changing over" to snow. As the chemical nucleation assault unfolds, the temperatures on the ground level can and do cool dramatically as a cold dense layer of air is created. 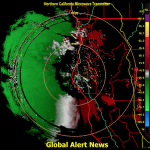 Also of note in the animation above, the impact of powerful radio frequency/microwave transmissions (used for climate modification) can clearly be seen in parts of Idaho and Washington. 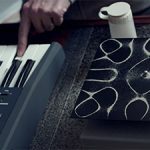 The close up screen shot below is of a radio frequency transmission source in Washington, taken at the same time as the animation above was recorded. 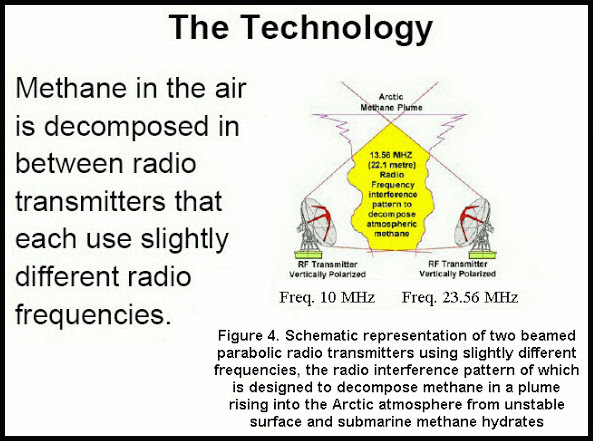 The RF transmissions are a primary component of the ongoing climate modification processes. 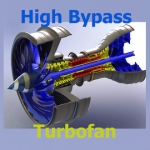 The next close up screen shot below, taken over an Idaho RF transmission source, was also captured at the same time as the animation shown earlier. 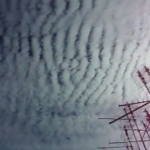 The RF/microwave transmissions are just one more catastrophically harmful aspect of geoengineering programs. 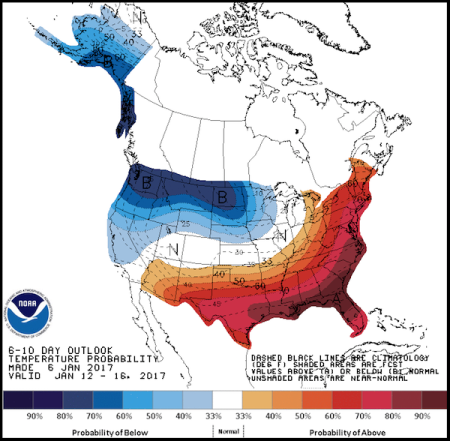 The next two NOAA extended "forecast" (scheduled weather) maps below reveal what is coming for the US, yet more extreme weather whiplash. The chemical cool-downs cannot be kept up indefinitely, the record warmth will again re-appear in the south and East. Every engineered cool-down that is carried out by the climate engineers comes at the cost of an even worse overall planetary warming. The next extended forecast map below clearly shows a continued expansion of the extremely rapid rebound of warmth for the US. This extended "forecast" map also clearly shows where the climate engineers plan on focusing their efforts next, Alaska (along with continueing massive operations in Europe). 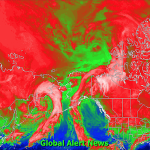 The 48 of the US are headed back toward record heat as the geoengineers will do all they can to chemically cool the Arctic in their ever more desperate attempt to hide the implosion of the ice at the poles. 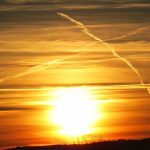 The climate engineering chemical cool-downs are used to temporarily (and toxically) mask the ongoing planetary meltdown. 2016 was yet another record shattering warm year on planet Earth. 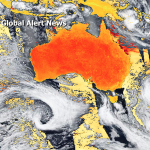 Radical weather whiplash scenarios will continue to rapidly worsen. 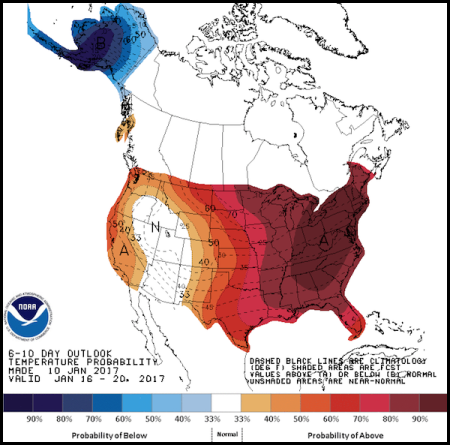 The final NOAA extended "forecast" map indecates that record breaking high temperatures will rapidly replace the preceeding climate engineering chemical cool-downs. 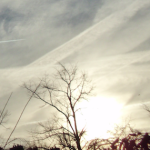 We must expose and halt the ongoing climate engineering insanity, this is not an option, but an absolute imperative. Make your voice heard in this epic battle to salvage what is yet left of Earth's life support systems. The Dakota pipeline protests have become the frontline representation of the critical struggle against a completely out of control totalitarian power structure. 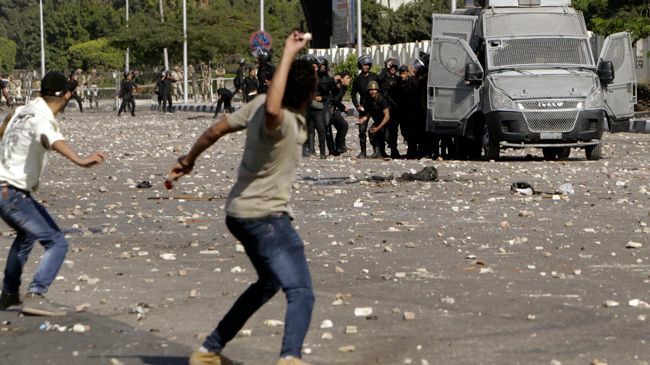 Those in power cannot afford to allow this justifiable protest to continue or succeed. 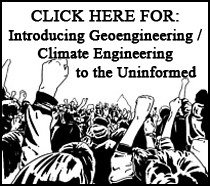 Geoengineering/weather warfare has now been added to the already long list of criminal assaults that have been hurled at the peaceful pipeline protesters. In the coming days and weeks, weather warfare will likely be the most deadly and effective weapon that the power structure will wield against the pieceful Dakota pipeling protesters. 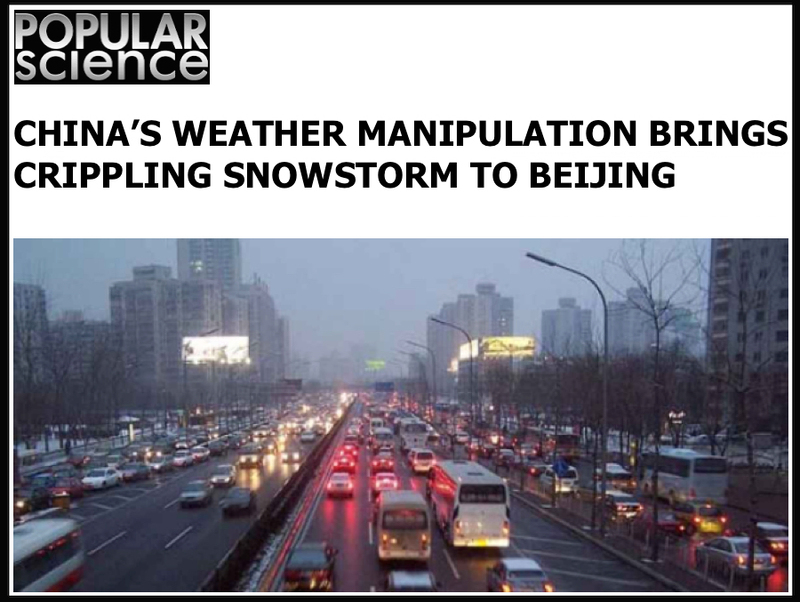 Climate engineering and the use of toxic chemical ice nucleation elements are the reason a record early season snow has just occurred in the exact region of the protests (named winter storm "Blanche"). If you don't believe snowstorms can be completely engineered, you have not done your research. Weather warfare has long since been a covert weapon of choice for the criminals that truly control our government. Is it just a coincidence that a record early season snowstorm also decimated the Occupy Wall Street protesters? 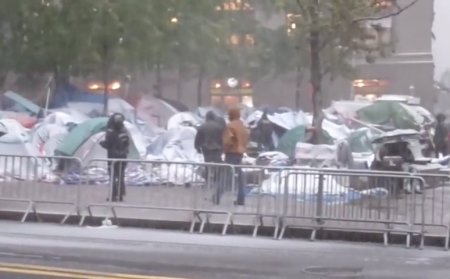 Occupy Wall Street protesters prepare for the record October, 2011, snowstorm that decimated their camp. 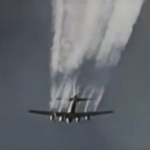 Weather modification activities were also noted over the massive historical gathering in Woodstock. The combination satellite radar images below clearly reveal extreme and completely unnatural weather anomalies over the continental US. 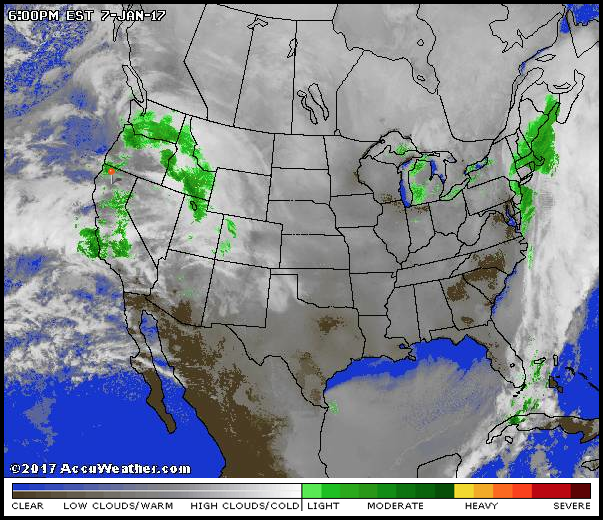 The first satellite/radar image below was taken at 11:30 am (ET), Monday, shows a ribbon of warm air and moisture flowing in a northeasterly direction all the way from far west of Baja California, across Mexico and Texas (picking up even more warm moisture from the Gulf of Mexico). This flow of warm air and moisture pushes north where some of it eventually gets caught up in the counterclockwise low pressure system being held directly over the protest region (via atmospheric manipulation with radio frequency/microwave transmissions). 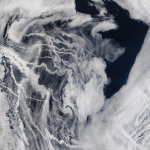 An engineered winter chemical ice nucleation assault (by jet aircraft aerosol spraying) was then unleashed in the stationary low pressure circulation. Note the center of the counterclockwise spinning low pressure system centered almost exactly over the pipeline protest region. 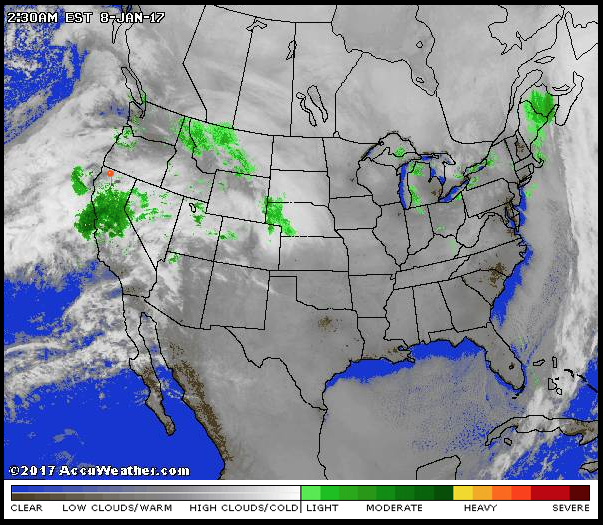 Massive atmospheric aerosol spraying operations were also occurring off of the US west coast on Monday, November 28, 2016. 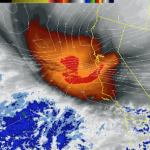 The aerosol saturation reduces west coast precipitation and thus contributes to the effective migration of Pacific moisture further east toward the low pressure vortex over the protest zone. 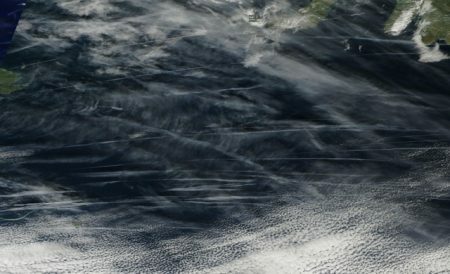 In addition to the extensive aerosol spraying visible in this NASA satellite image, some radio frequency manipulation waves can be seen in the upper right corner of the satellite image. 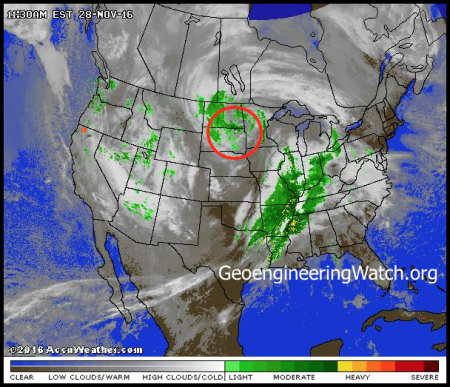 By the evening of Monday, November 28, 2016, the huge plum of warm moisture is pulled closer to the still stationary spinning vortex over the Dakota protests. Aerosolized chemically cooled moisture flowing in from the Pacific also merges with the engineered Dakota snowstorm. 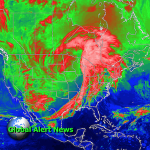 At 9:45 am (ET), November 30, 2016, the stationary Dakota vortex continues to spin (winter storm "Blanche"). 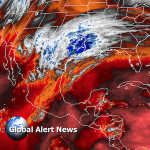 The plume of warm Gulf of Mexico moisture is now directed at Maine, where "winter storm Blanche" has been scheduled by the weather makers to continue (completely separated from the still ongoing original "winter storm Blanche" over the Dakotas). The engineered cutoff low pressure zone has remained incredibly stationary and nearly centered over the Dakota pipeline protest zone. The "departure from normal high temperature" map below reveals just how warm it actually was in the regions near the center of the Dakota storm and along the entire track from which much of the storm moisture came. 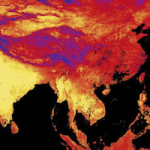 Radical temperature divides, like the departures from "normal" reflected in the map above (shown in degrees Fharenheit +/-), are historically unprecedented. Now such incredible imbalances have increasingly become the norm. The animation below contains the most revealing and important images of all. 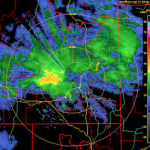 Drifting cells of liquid precipitation (rain) should not just "flash out" to frozen precipitation (snow) for no reason whatsoever (no change in topographical elevation and no colliding cold air masses). 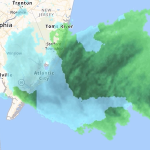 Areas of the storm then suddenly flash back to rain as the jet aircraft sprayed chemical ice nucleating agents settle down through the air column. 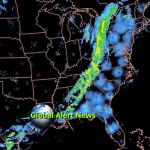 Examine this animation closely, it is the "smoking gun" of a completely engineered chemically nucleated weather warfare assault. 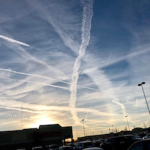 Massive climate engineering/chemical ice nucleation deployments can and will continue to create toxic cool-downs and radical weather anomolies. 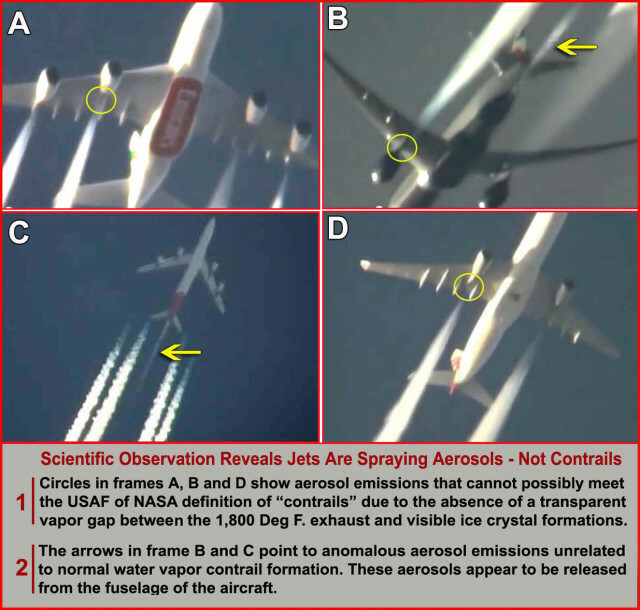 These anomalies will continue to manipulate the perception of populations who don't realize (or are not willing to accept) what is going on in our skies. 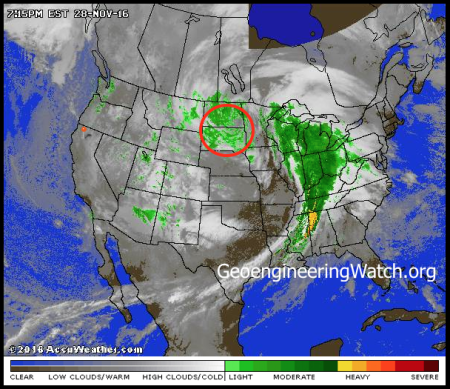 All the weather modeling for NOAA and NWS (National Weather Service) is done by private defense contractor, Raytheon, a corporation that is a primary climate engineering entity. 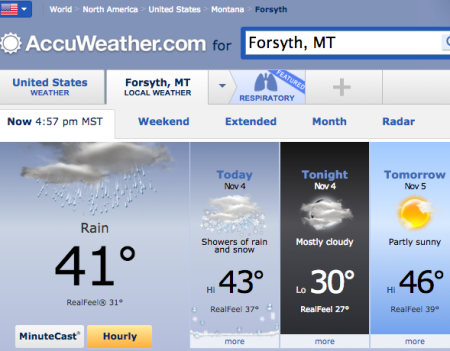 This means that the weather forecasts are now the "scheduled" weather. 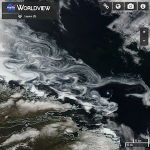 Why don't employees of NOAA and NWS speak out about the climate engineering insanity? Because all the employees of both agencies have a federal gag order on them. 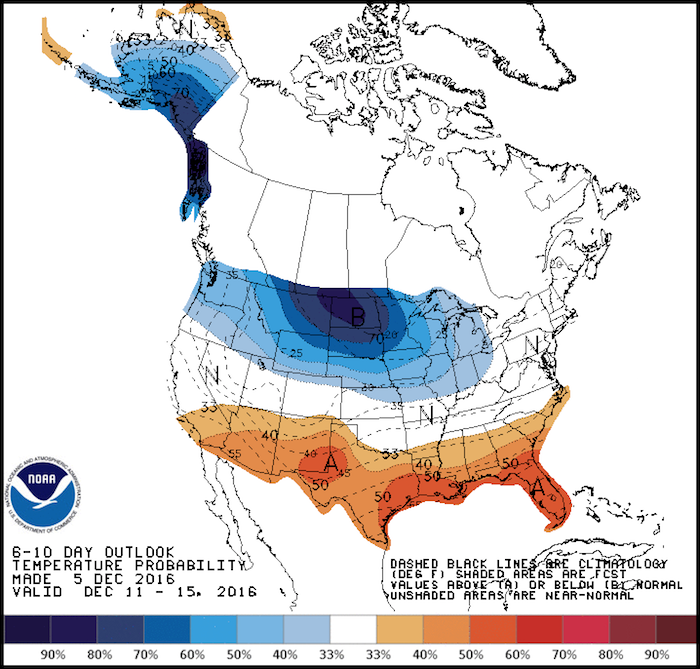 The NOAA (National Oceanic and Atmospheric Administration) extended temperature forecast map for November 6-10 is below. 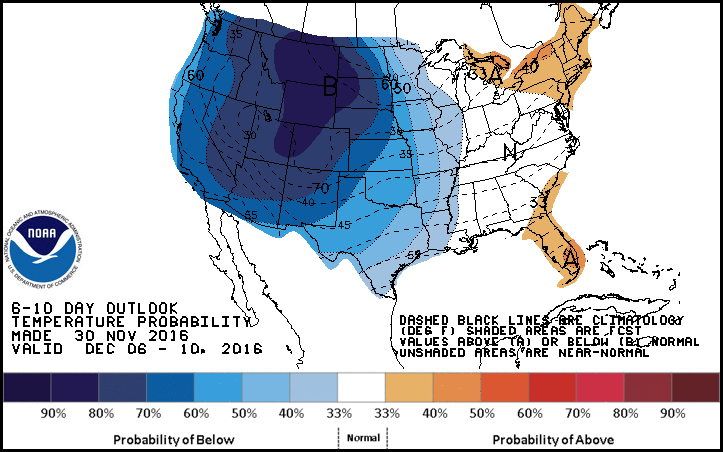 The ongoing geoengineered cool-down is then "forecast" to center almost directly over the Dakota protests (shown in the NOAA map below). 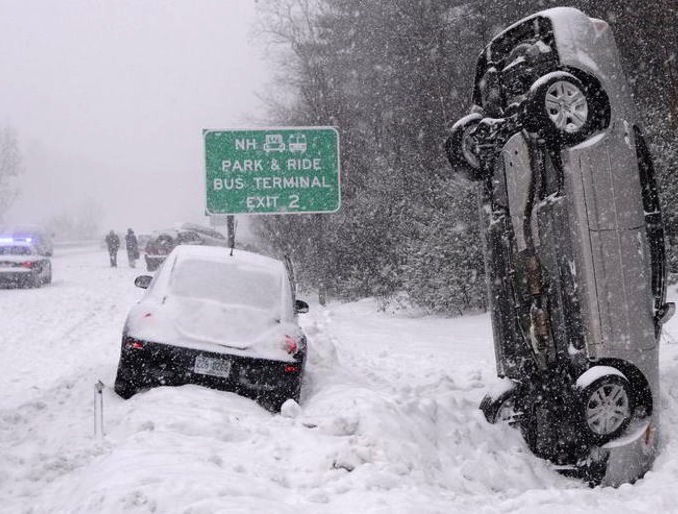 Again, it is important to understand and remember that engineering snowstorms is a well established technology that has long since been admitted to by mainstream sources. 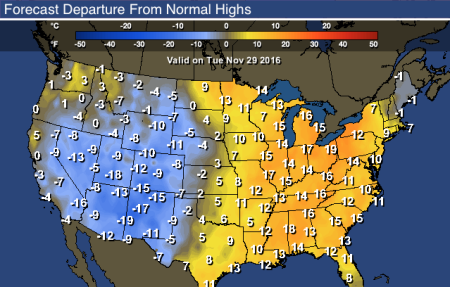 The center of the cold zone in the US has remained astoundingly centered over the Dakota water protecter region as the 3rd NOAA "departure from normal high temperature" map below reveals. 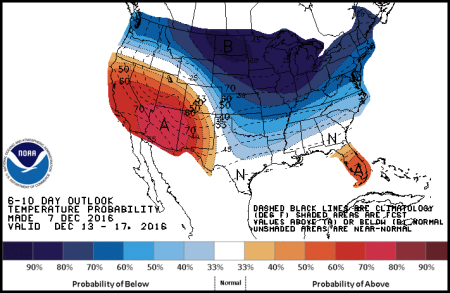 The NOAA map above shows continued predictions for record cold temperatures at or near the Dakota pipeline protest for yet another 6-10 day period. 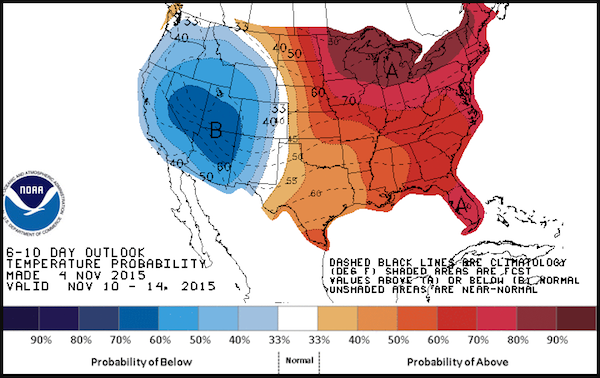 Also anomolous in the latest forecast map is the building heat dome in the US southwest. 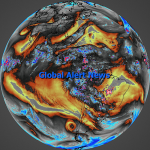 Climate enigneerign is greatly contributing to increasingly alarming extream temperature imbalances. Each color tear represents a 2-3 degree departure from normal high temperatures. The NOAA extended forecasts temperature predictions from late November were for the middle northern tear states to be at or near record high temperatures, what changed? 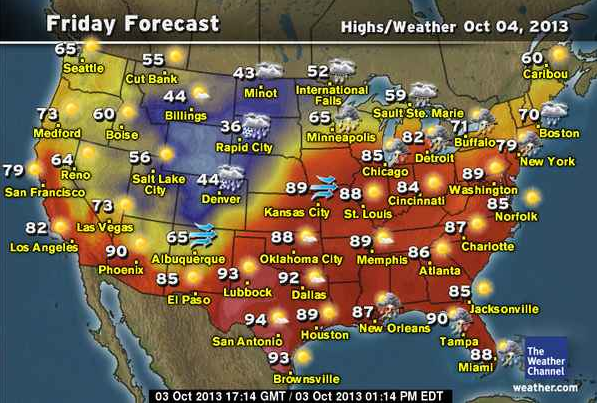 The US military industrial complex has long since stated its desire to "own the weather" on the record, now they do. 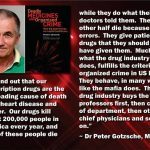 If you don't think that the order followers within the ranks of own government and military would carry out such toxic and deadly experimentation/assaults against US citizens, think again. Why would the global power structure go to such lengths in the attempt to bring the Dakota pipeline protests to end? 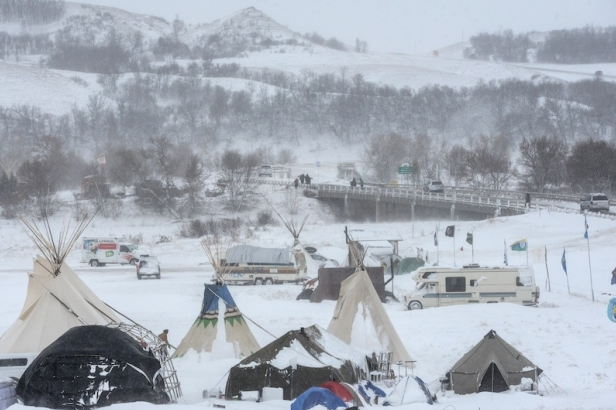 Because the Dakota protests represent the rapidly growing will and unity of the people to take a stand against the criminal corporate and government tyranny that has completely taken over our country. The power structure will clearly do anything they can get away with to crush this all important protest. We must not let this happen. 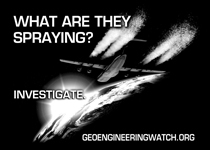 GeoengineeringWatch.org is working directly with representatives from the protest to test samples of precipitation and aircraft aerosol spraying that has taken place at the protest site. All of us are needed in the critical battle to sound the alarm on what is occurring at the Dakota protest, share credible information, wake others up to the truth, make your voice heard. 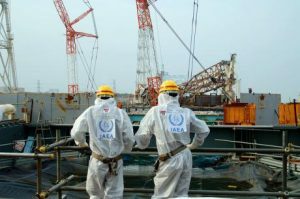 Hiding the severity and immediacy of countless converging catastrophes from populations (until the last possible moment) remains a top priority for the global power structure. The NOAA "departure from normal high temperatures" map below covers the period from October 16th through the 20th. NOAA modeling is done by private defense/geoengineering contractor, Raytheon, thus their "forecasts" amount to the scheduled weather. Every color tier reflects a 2-3 degree "departure from normal" to the high side or low side, depending on the color hue. 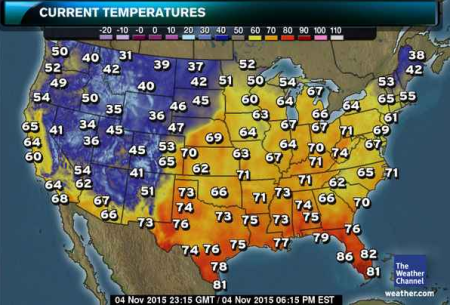 If the profound imbalance of temperatures shown in this map does not alarm you, it should. 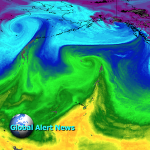 While record high temperatures are being set throughout much of the country (and the world as a whole), the US West Coast and parts of Alaska are temporarily (and toxically) cooled off by a massive plume of moisture (snow is even falling in the Western US). Atmospheric aerosol spraying (including chemical ice nucleation elements) are being dispersed by jet aircraft as the ongoing climate engineering operations further derail Earth's weather and life support systems. 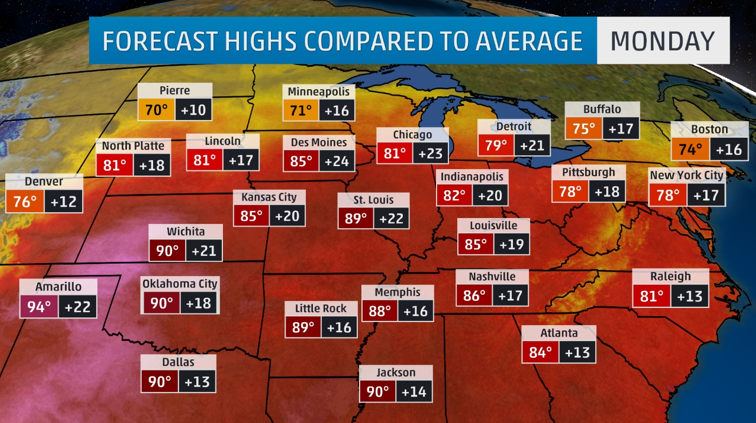 Record setting high, summer like, temperatures will continue into the week for much of the US. At the same time that record high temperatures being set in so much of the US, snow is miraculously falling in other parts of the lower 48 states. 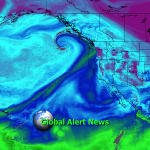 Snow is occurring (due to chemical ice nucleating elements) in some locations in spite of above freezing temperatures and in spite of warmer flows of moisture off of the record warm Pacific Ocean. 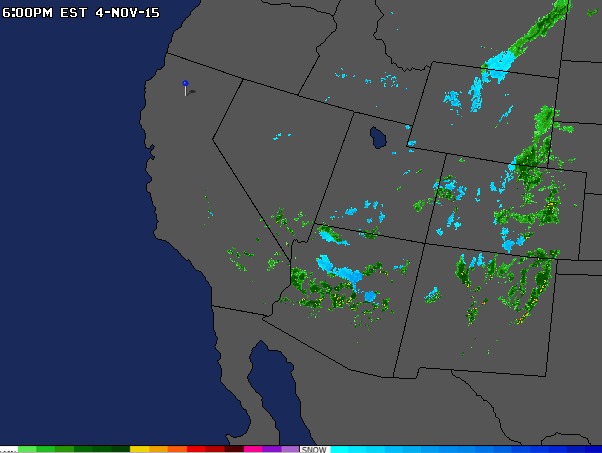 Snow (shown in blue on the map below) is cleary showing up across the Western US. 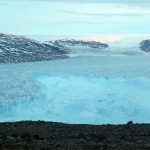 As the climate engineers continue to force the climate system to ever greater extremes of temperature imbalances, the biosphere's ability to cope is rapidly breaking down. 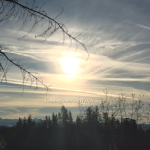 In addition to the temperature extremes, there is the issue of the highly toxic geoengineering/solar radiation management fallout that is contaminating the entire surface of the planet and every breath we take. The "departure from normal high temperature" map below reflects variances from "normal" temperatures in degrees Fahrenheit. These imbalances are already far beyond extreme and growing worse rapidly. 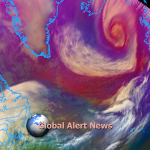 As the moisture flows in from the coast, the air masses below it are cooled by the aerosol/ice nucleating dispersions already mentioned (chemical ice nucleated events are occuring all over the globe). 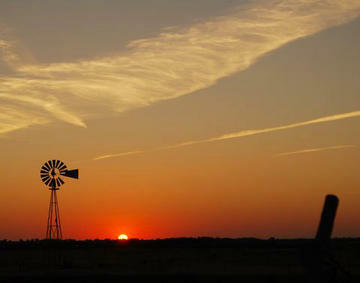 The same aerosols (which are manipulated with radio frequency transmissions) have the effect of scattering the moisture into vast expanses of largely rainless cloud cover. 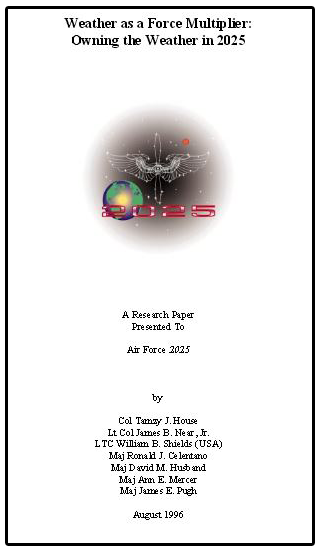 This is the stated goal of solar radiation management (SRM). 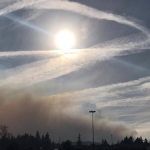 The sun blocking aerosolized clouds, of course, also trap heat (in addition to countless other negative effects) which further fuels the overall planetary meltdown. 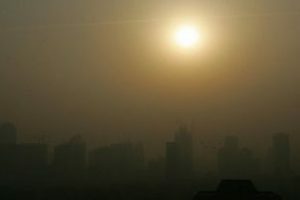 The planet is already warming at a "runaway" pace with nightime low temperatures rising even faster than daytime highs. The brighter the white of the cloud cover shown in the combination satellite radar image shown below, the more aerosolized the cloud cover is. 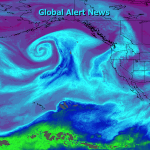 The constant aerosol saturation of the moisture flows, as they approach from the west, continues to rob desperately needed rain from California. 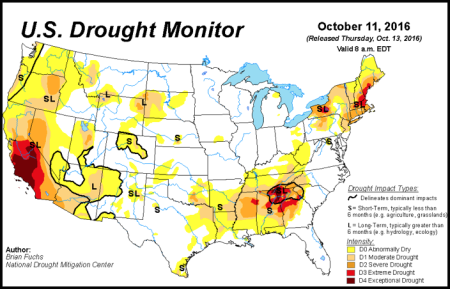 The US Drought Monitor map below does not begin to reflect the true severity of the drought and the decimation it is causing. 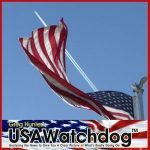 Why are National Weather Service and NOAA employees completely completely mute on the subject of climate engineering? Illegal federal gag orders have ensured their silence. 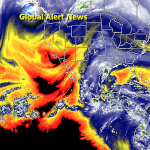 Global climate engineering is weather warfare, and biological warfare, nothing less. 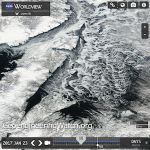 Geoengineering is not mitigating the overall planetary warming, it is actually fueling it. 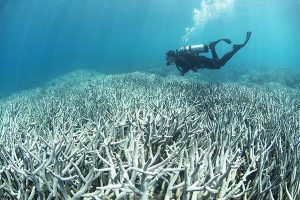 In their increasingly desperate attempt to mask the unfolding climate crisis from the public, the climate engineers are tearing Earth's life support systems apart. Our battle for survival is here, and now. Help us with the critical battle to sound the alarm, every day counts. The layers of insanity continue to grow, each heaped on top of another. 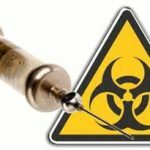 The programmed human delusional mindset of the "techno fix" will very soon lead us to the total extermination of all life on Earth if it is not stopped. Methane is rapidly saturating the atmosphere of our planet. 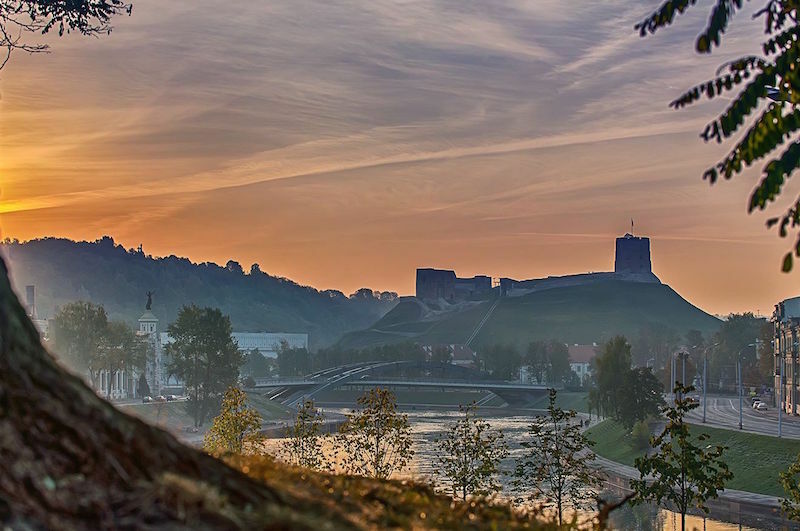 There have been countless triggers and causal factors to the unfolding cataclysm occurring over our heads, but the single greatest component of biosphere decimation is climate engineering. 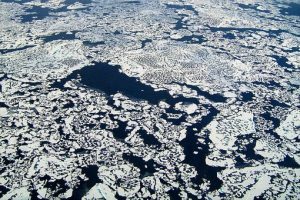 The front line Arctic scientists are in a justifiable panic about the blanket of methane that is rapidly covering the planet. 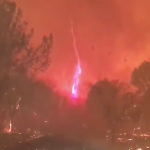 They are urgently proposing the immediate deployment of mobile RF (radio frequency) transmitters to microwave the atmosphere with opposing frequencies. This proposal is a last ditch effort of total desperation to try and degrade the atmospheric methane buildup. 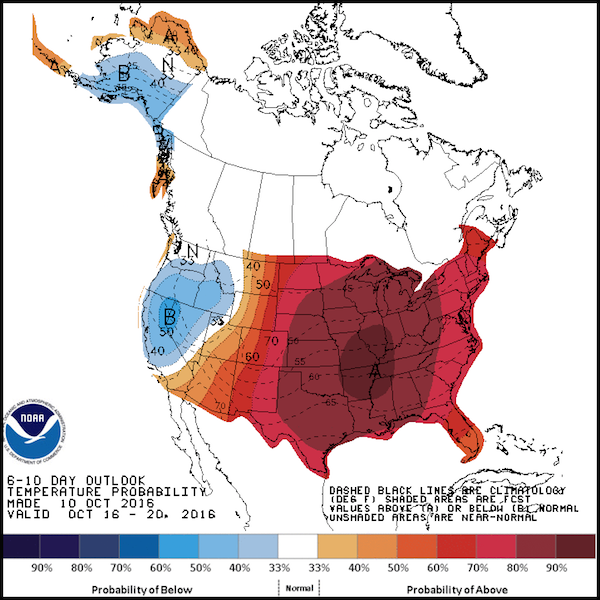 There will be a presentation to address this "proposal" at the American Meteorological Society's 18th Conference on Atmospheric Chemistry, January 10-14, 2016, in New Orleans. 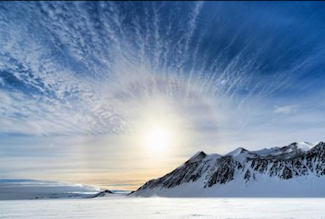 Unfortunately, these same Arctic scientists are either completely disconnected from reality or lying about the fact that geoengineering has already been going on for 65 years or more. The microwaving of the atmosphere to attempt degrading of methane (check project LUCY and Alamo) has also likely already been fully deployed long ago and is furthering the overall decimation of the climate system. 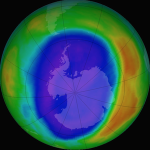 The atmospheric methane acts like a layer of glass, thermal energy comes in, but cannot effectively escape. 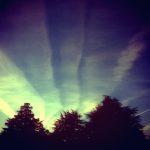 The continuing expansion of geoengineering is nothing more than an escalation of the already catastrophic destruction inflicted by these programs. 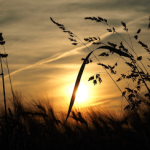 Climate engineering is the "cure" that is even worse than the crisis it claims to mitigate. 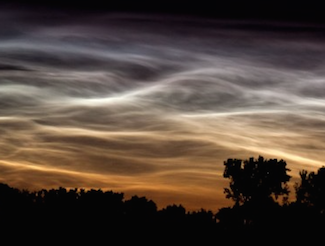 Microwaving the atmosphere will only further exacerbate already unimaginable environmental destruction. The latest NOAA "forecast" map below is alarming to say the least. 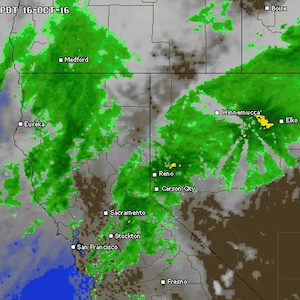 It is nothing more than the scheduled weather from private defense contractor Raytheon. 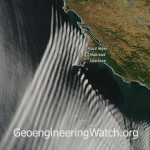 All the weather modeling for the National Weather Service and the National Oceanic and Atmospheric Administration (both organizations now have federal "gag orders" placed on them) is done by Raytheon, who is also heavily involved in climate engineering. 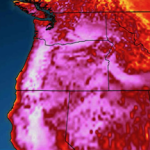 The radical imbalance reflected in the NOAA map below will worsen as the climate engineers continue to chemically cool selected regions on a rapidly warming planet. 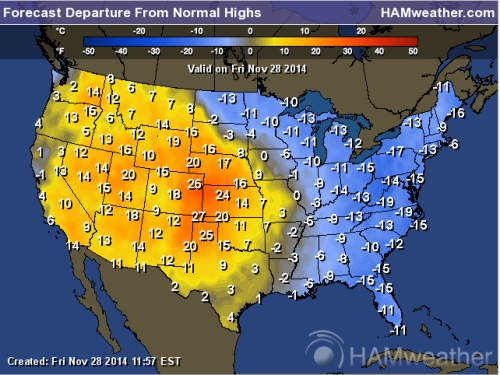 Each color shade above reflects a 2-3 degree "departure from normal temperatures". 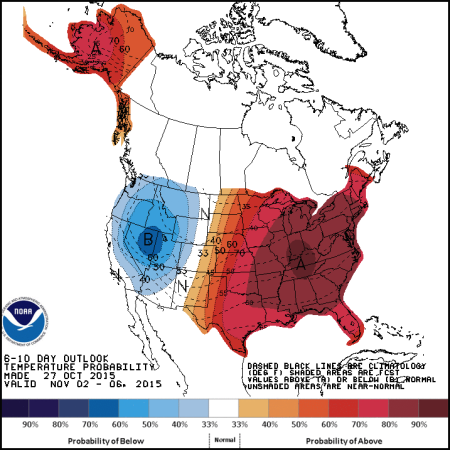 If this NOAA map does not alarm you, it should. The IPCC (Intergovernmental Panel on Climate Change) is the largest scientific panel ever created in human history on any subject. Contrary to what many would like to believe about the IPCC, they are not exaggerating the severity of global warming, but radically underreporting it. Thawing methane deposits (the most threatening climate factor of all) is not even considered in IPCC climate models. 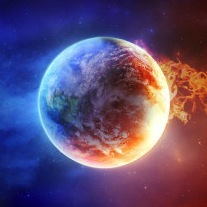 The buildup of thermal energy on our planet is already skyrocketing beyond comprehension (the equivalent heat energy of 400,000 Hiroshima bombs per day). El nino continues to build as sea surface temperatures go off the charts. The bottom line is this, we are in completely uncharted waters. The ever increasing layers of climate engineering insanity are exponentially increasing the severity of what we collectively face. 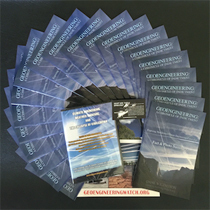 The January 2016 meeting of the American Meteorological Society in New Orleans is an important event that should be attended by as many anti-geoengineering activists as possible. Any activists that do attend should arm themselves with credible informational flyers to distribute. 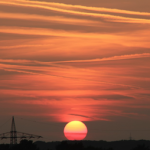 It is up to all of us to send the following message: it is not OK for societies and scientists to participate in the lethal climate engineering programs in pursuit of their paychecks and pensions. We must send the message that the public will soon enough hold them legally and morally accountable for their criminal actions. All of us are needed to assists in this critical fight for the common good. 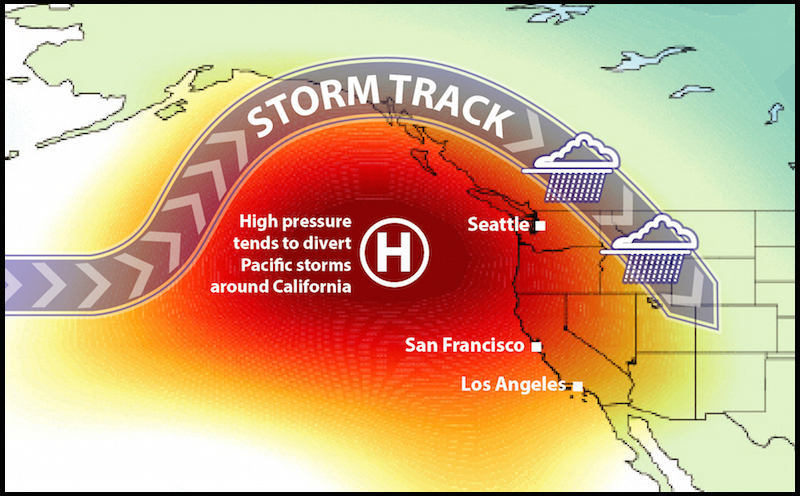 A "1000 year" flood has just occurred on the East Coast and a "1200 year" drought continues to worsen rapidly on the West Coast. 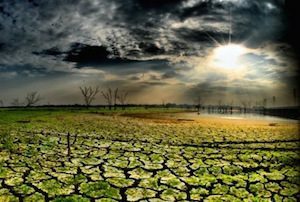 In fact record shattering floods and droughts are rapidly accelerating all around the globe. "Official sources", of course, tell the American public that unprecedented weather events are just "natural" and the vast majority unfortunately accept this lie without so much as a second thought. 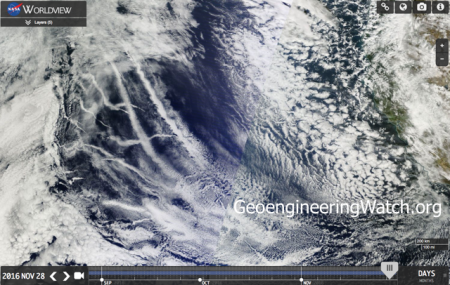 Though countless anthropogenic (human) activities have done immense damage to the climate system, the ongoing global climate engineering (weather warfare) insanity is the greatest single disrupting factor of all. 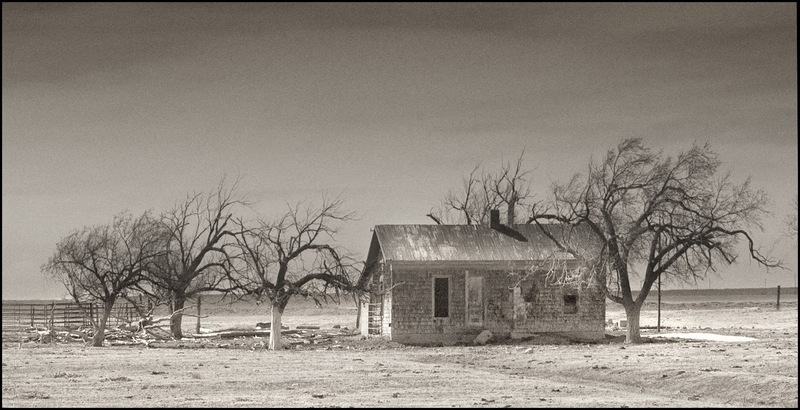 "100 year" disasters are now occurring every 100 days or less. The images below should be carefully examined. 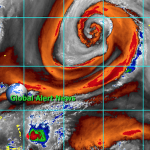 The flow of moisture from hurricane Joaquin was manipulated between a clockwise spinning high pressure zone to the north of Joaquin and a counterclockwise spinning low pressure zone to the west of Joaquin. 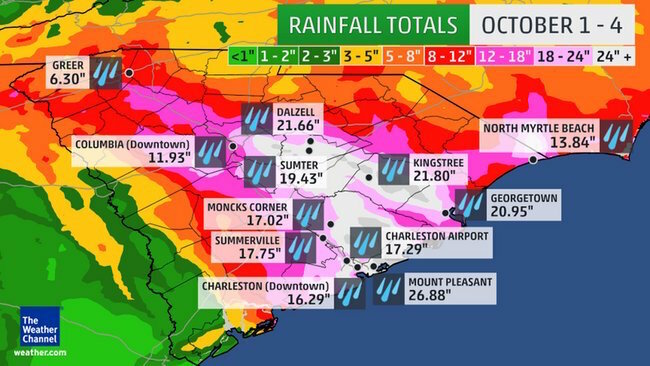 There were at least 8 meteorological factors that all had to come together in order to create the fire hose effect that just devastated South Carolina. Even more astounding consideration is that these factors generally remained in place for three consecutive days. 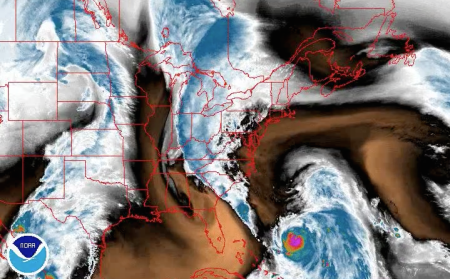 The spinning vortex from Joaquin helped the climate engineers cover the Northeast with heavily aerosolized SRM cloud canopy. Hurricane Joaquin was essentially a water pump for the geoengineers and the immense moisture from this source was profoundly focused on a specific region, South Carolina. 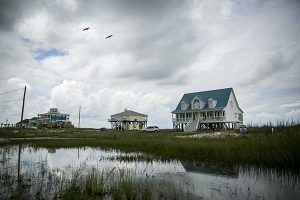 In a rapidly warming world deluge events would be expected to increase. 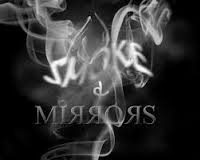 But it is the intentional manipulation of the climate system that is making some events so concentrated and deadly. 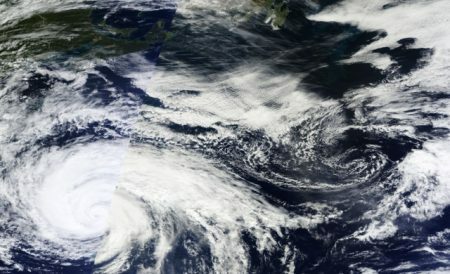 Hurricane Joaquin was initially forecasted to make US landfall, in fact, it initially showed many similarities to the initial stages of hurricane "Sandy". Then, literally overnight, all the "forecasts" changed. 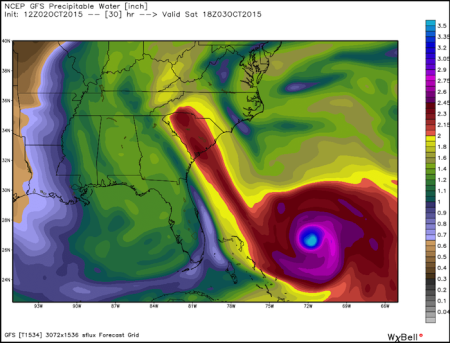 Meteorologists stated on the record that hurricane Joaquin was very hard to predict. How can the weather be predicted when the climate is being completely manipulated by multiple global powers? 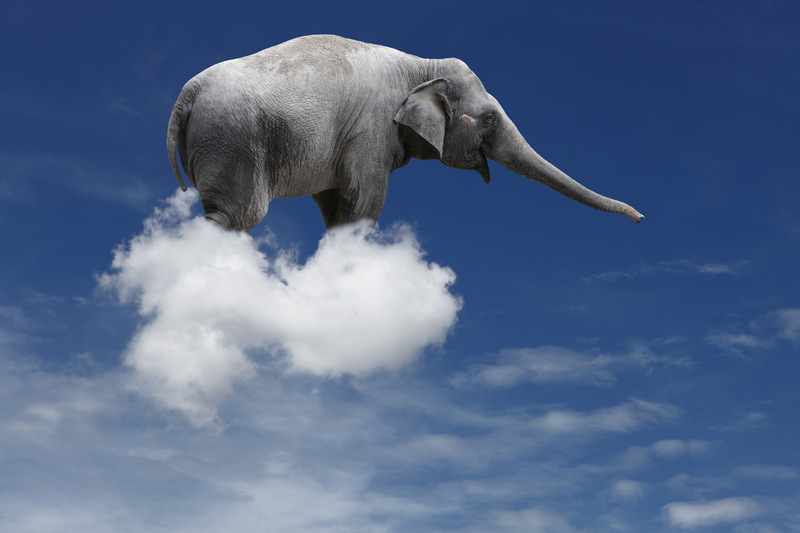 Yet, the geoengineering elephant in the room remains a tabu subject in the meteorological and mainstream media communities. Meteorologists are paid to explain away the completely engineered weather as "natural", they are covering the tracks for the geoengineers. 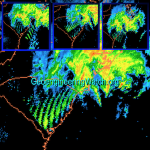 As of October 5, 2015, the path of "Joaquin" was being heavily sprayed with aerosols by jet aircraft as the satellite photos below clearly show. Massive aerosol spraying is clearly visible across the North Atlantic (top center of above image) directly in the path of Joaquin. 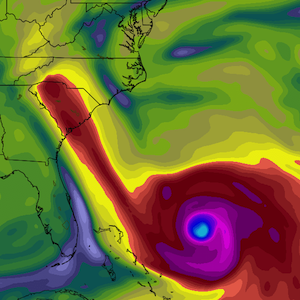 Joaquin is heading toward (being steered?) 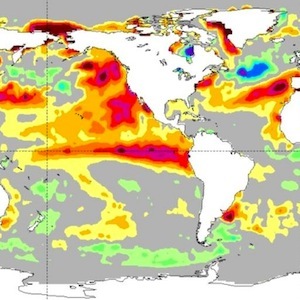 the extremely anomalous cold "blob" in the North Atlantic which has scientists "puzzled". 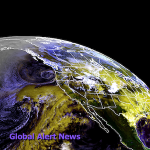 Excessive atmospheric moisture is a necessary component of the chemically nucleated short term cool-downs being carried out around the globe. 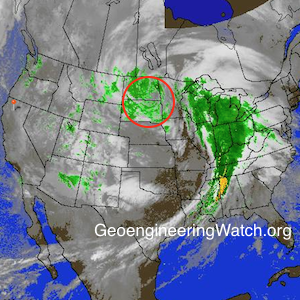 Could the geoengineers have an agenda to direct this major moisture producing storm to this region? Many scientists are already concerned about the effect the "cold blob" is having on the thermohaline circulation (Gulf Stream), could the climate engineers be attempting to actually manipulate this critical ocean current? On the opposite side of the US the "forecasts" (scheduled weather) for continued record heat, drought, and fires, are still worsening. The map above is a NOAA "departure from normal high temperature graphic. 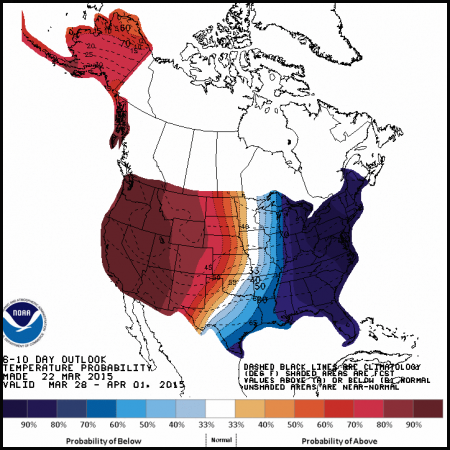 Each color coded band represents 2-3 degrees above "normal" temperatures. 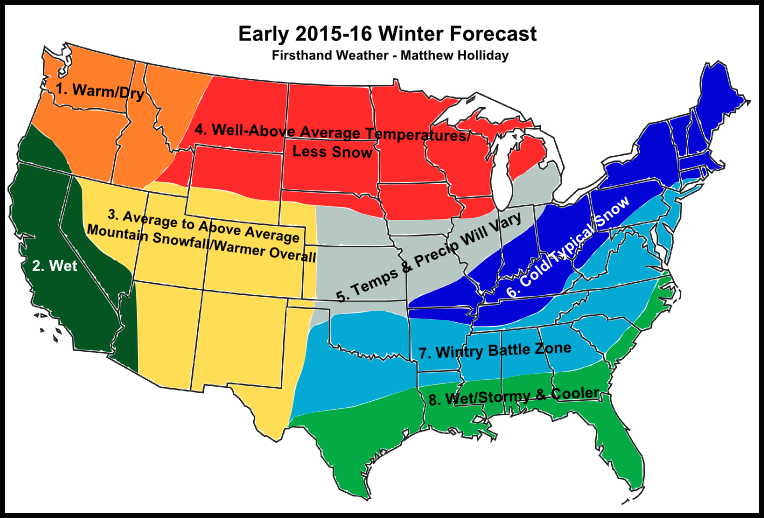 If this "forecast" map does not look alarming to you, it should. 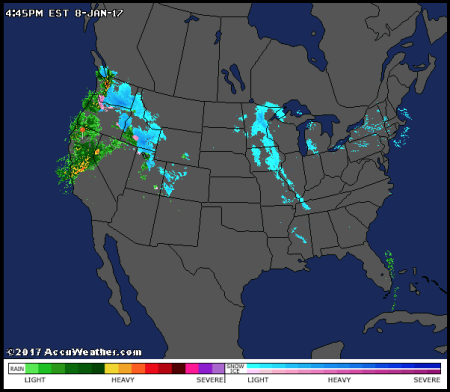 For the record, private defense industry contractor "Raytheon" does the weather "modeling" for NOAA and NWS (The National Weather Service). 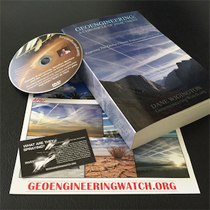 Raytheon is involved in the climate engineering industry. The engineered Western US meltdown continues as the geoengineers attempt to keep the Eastern US cooled down. 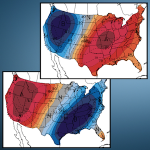 Though weather "whiplash" of up and down hot and cold events is occurring in the US East, overall cooler temps in the eastern half of the US lower 48 are so anomalous that scientists (who refuse to acknowledge climate engineering) can't figure it out. Even Major University scientists have questioned how the Eastern US can be anomalously cool in a record warm world. 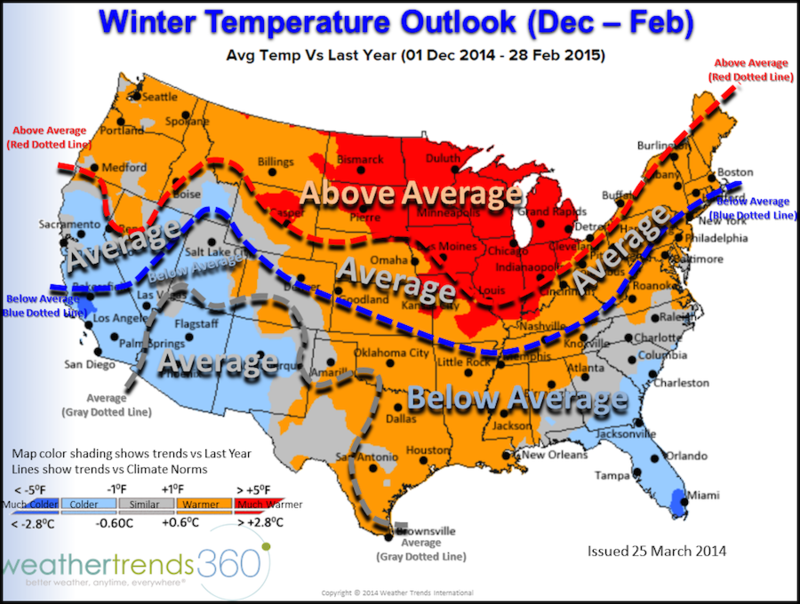 How is it possible that the Eastern US has remained cooler overall during the last 3 years? 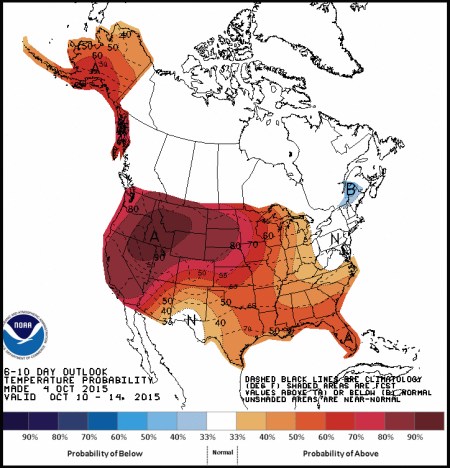 This is in spite of the fact that high temperature records continue to be shattered all over the globe? 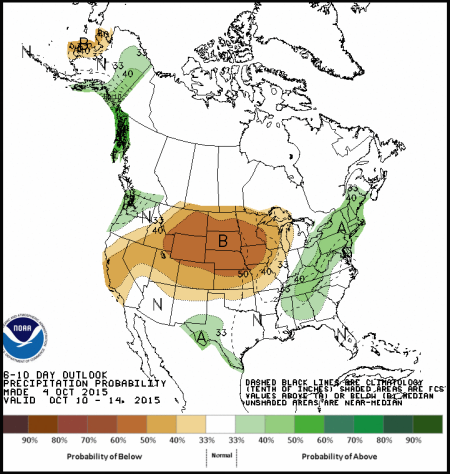 The graphic above is an NOAA "departure from normal precipitation" map. Along with the record heat, far below normal rainfall is also forecasted (scheduled) for the already drought devastated California. 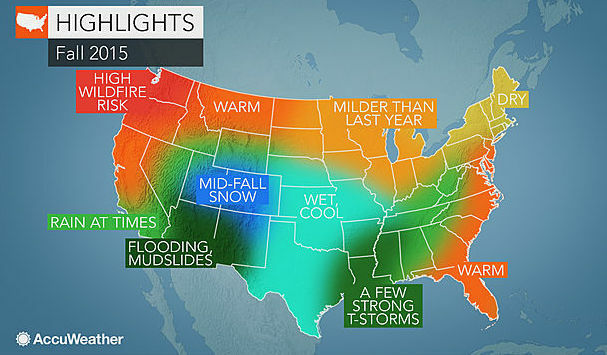 The contradictions of precipitation reflected in this "forecast" map are a further reflection of the ongoing total manipulation of the climate system. As 2014 ended the California drought was considered the worse in at least 1200 years and it has gotten much worse since. 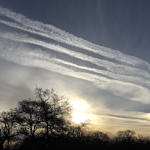 If all available data is taken into account, the particular case of the California drought must be considered a direct consequence of the ongoing geoengineering/solar radiation management programs. 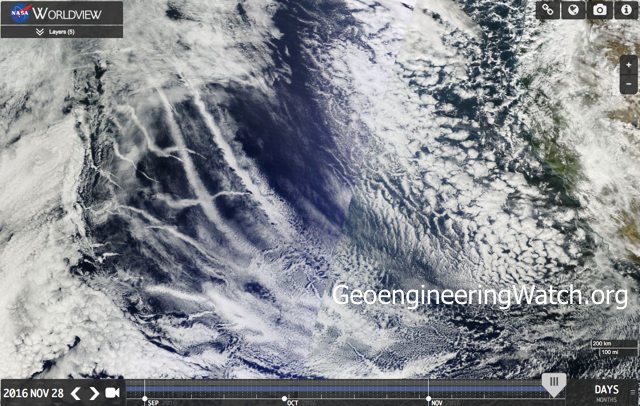 Climate engineering is weather warfare, nothing less. 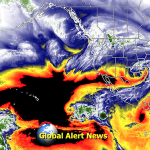 Record shattering rainfall and record shattering drought are rapidly increasing around the globe. 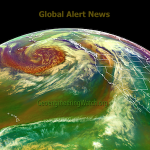 The highly toxic fallout from the ongoing jet aircraft aerosol spraying means that climate engineering must also be considered biological warfare. 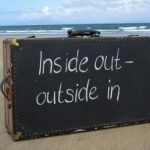 I receive many communications from people around the world asking "where can I move to in order to escape these programs"? Answer, there is no place to hide. 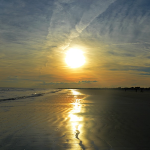 We have only one choice, to unite in our efforts to expose and halt the climate engineering insanity. 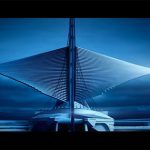 Make your voice heard in this most critical battle while there is yet any part of Earth's life support systems left to salvage. 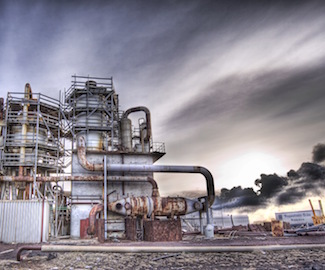 The majority still subscribe to the delusion of industrialized society as a benefit to the human race, but can such a conclusion be rationally defended? Global climate modification is the pinnacle of industrialized insanity and arrogance. 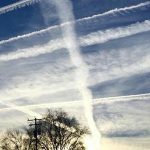 Even now, as life on our planet is struggling desperately to survive, the military industrial complex that rules the world is pouring Earth's dwindling finite resources into yet more destruction with geoengineering at the top of the list. 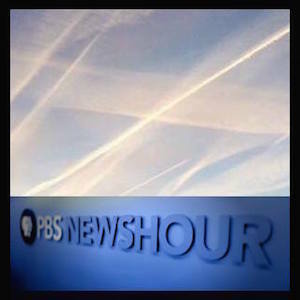 PBS Covers Climate Engineering, How Much Longer Can It Be Hidden? PBS is a disinformation mouthpiece for the establishment, nothing more than paid propaganda. Those that believe there is any objectivity in the reporting of this bought and paid for agency of the power structure are sadly mistaken. Like "journalists" at so many other mainstream media sources, the PBS crew is not allowed to tell the truth (if they want their paychecks) and they lack the courage to speak the truth out of their own convictions. 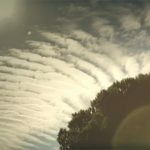 In the 8 minute video below, PBS does their best to push climate engineering as a potentially viable option. 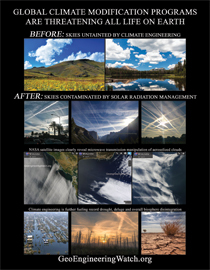 Of course, they do not mention that global geoengineering has been going on for over 6 decades with catastrophic results. Is anyone surprised to know that PBS taken the side of defense contractor Lockheed Martin (a company that is directly involved with the climate engineering cabal) over the public? 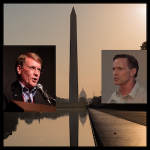 Geoengineer David Keith (whom I have had the displeasure of meeting face to face at an international geoengineering conference) is no more than a public relations prop for those in power. He has no regard whatsoever for the truth and in recent years seems to make it up as he goes along. At the conference I attended with Keith, he was pushing for the dumping of 10 to 20 million tons of aluminum into the atmosphere annually. 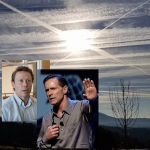 Keith no longer publicly mentions that aluminum is the material of choice for aerosol geoengineering, though he made this point clear in the past as the 4 minute video below clearly shows. 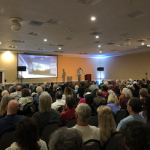 David Keith then went on to make clear that there had been virtually no scientific studies done in regard to the contamination to the entire planet that would obviously be caused by his proposal of filling the atmosphere with aluminum nanoparticles. 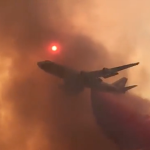 "Weather trading derivatives" are nothing more than a disaster based gambling casino run by the same global powers that are in many ways orchestrating the disasters in the first place. Weather "forecasts" are now the scheduled weather, major "forecasting" organizations are also owned by the power elite. 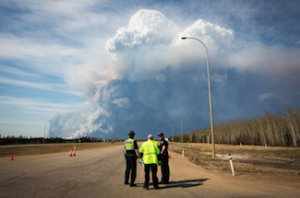 "Weather risk management" is the term for the industry that is thriving from the rapidly increasing occurrences of weather disasters. A mission statement from one of the disaster capitalist companies is below. 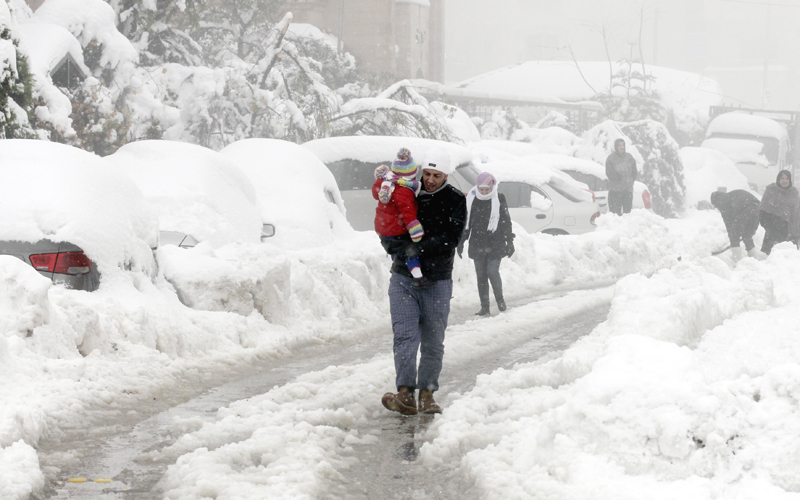 The weather can generate substantial economic losses. It is essential to take such risk seriously. Adverse developments in temperature, precipitation, wind, or other weather variables can result in losses for a multitude of companies and state entities. 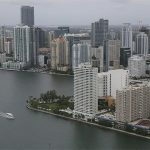 Risks derived from weather moves, independently of whether they are of a extreme or moderate nature, constitute an extended and permanent threat to a country´s productive capacity. 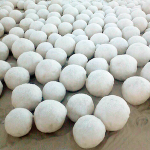 Fortunately, these days there exist financial solutions that can provide efficient cover. Bolsas y Mercados Españoles (BME), through its BME Clima project, endeavours to assist those entities with economic exposures to the weather. 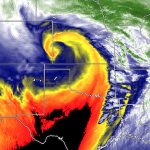 The goal is to offer information, data, and specialized advice that can help clients gain awareness as to their exposures, analyze the historical and current behavior of the relevant variables, as well as understand the solutions available in the weather risk management markets. The weather is possibly the most extended risk within the business community. 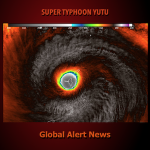 Unlike other sources of risk, such as interest rates or currencies, weather risk can be inevitable. 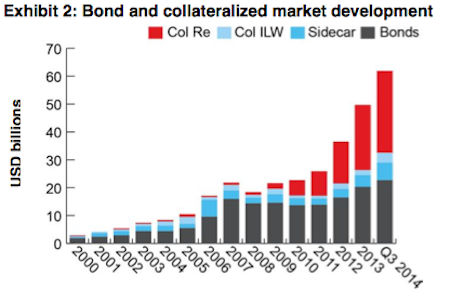 "Global catastrophe reinsurance" industry is growing exponentially along with the exponential increase in "natural" (engineered) disasters. Source: Aon Benfield Securities, Inc.
As temperatures tumble in North America, weather derivatives warm up. 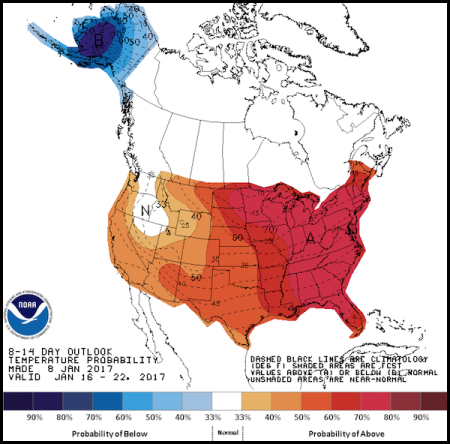 The completely engineered cool-down of the eastern US in the last two years has made fortunes for weather derivatives trading. The engineered drought in the US West has done the same. 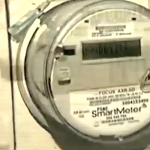 One of the more arcane financial innovations quietly continues to change and grow. 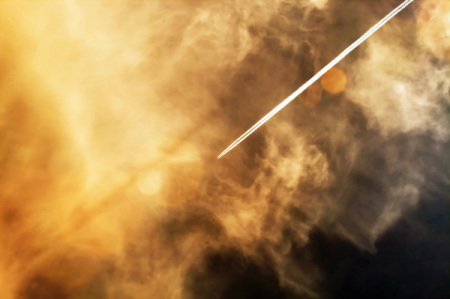 Unusual atmospheric patterns don't hurt. 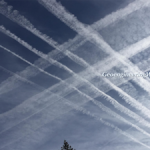 Climate engineering is the most powerful and most utilized weapon of the western power structure to destabilize and topple the countries and governments around the globe which it wishes to control. 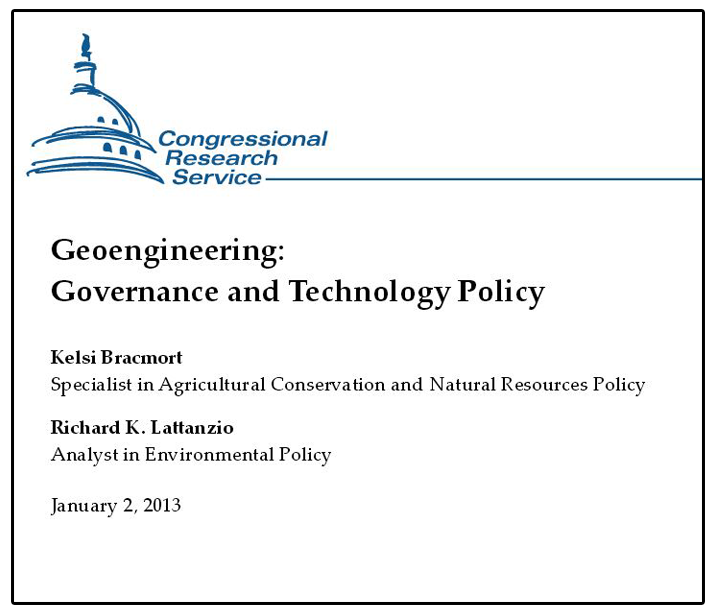 Geoengineering is a primary tool that has been used to help force nations to allow US or NATO occupation. If you don't believe the US military is concerned with the climate, think again. 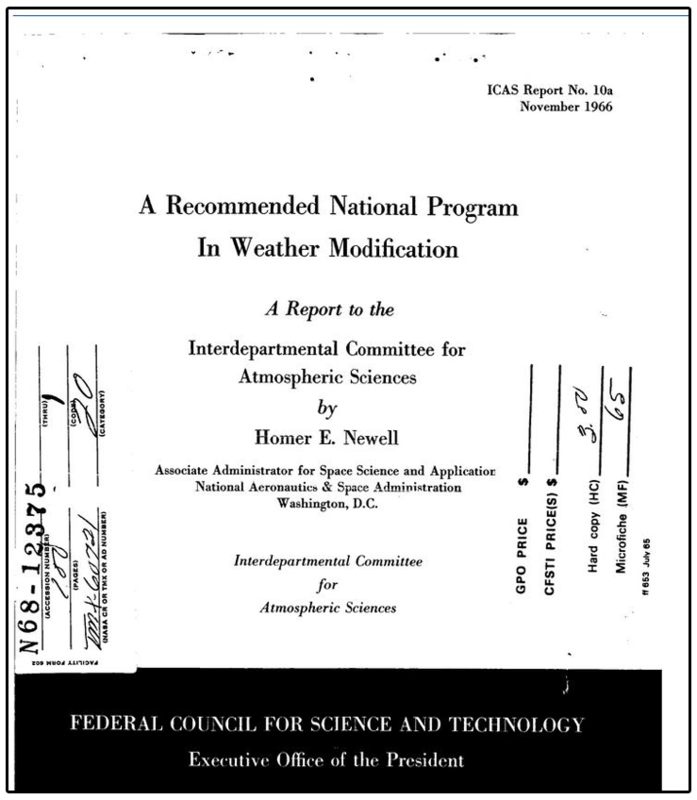 The military industrial complex has always sought to "control the weather" and historical documents prove that the US has been heavily invested in climate modification for a very long time. How many countries have US military boots on the ground? 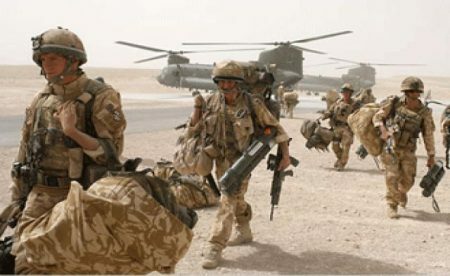 There are at least 156 US occupied countries around the globe with some 900 bases. Does anyone really believe that all these countries just wanted the US to occupy them? Is it a coincidence that many if not most of these countries endured some sort of climate cataclysm prior to the occupation being allowed? How many countries in Africa were subjected to record drought before being destabilized and occupied? 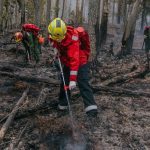 Occupations that often began under "humanitarian" pretexts due to climate catastrophes? What about the Middle Eastern countries that have recently been destabilized? 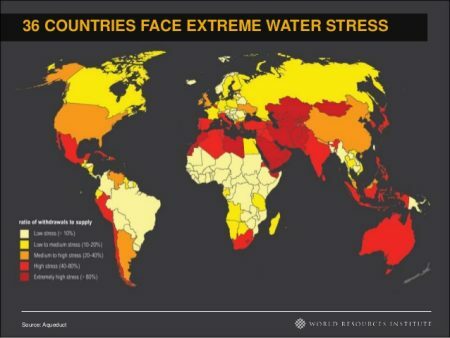 Many of these countries were not cooperating with the US agenda before they experienced record drought, is there a connection? 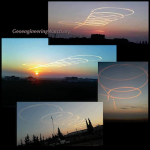 Record drought in Syria preceded the recent destabilization, was weather warfare used to help trigger the ongoing civil war? Yes. How about Iraq, were they also a target of weather warfare to help trigger destabilization? Was the record drought in Iraq during the years prior to the invasion in 2003 a natural occurrence? Or was it also engineered? Were there plans to invade Iraq years ahead of time? If available data is examined, the answer is inarguably yes. The invasion of Iraq was planned well before the events of 911. How many know there has been a crop destroying drought in Russia and Ukraine? Just another coincidence? 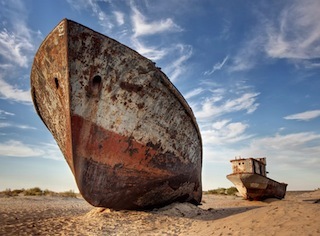 Certainly the whole world understands that Iran is also a current primary target for the western power structure, is it just bad luck for Iran that there is record drought there, too? 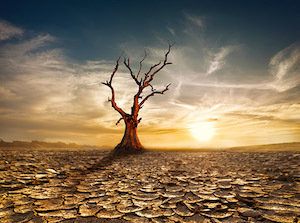 Does anyone in the US even know that the leaders from Iran have been on the floor of the UN openly stating that the western powers are causing the record drought with climate modification? Pakistan showed resistance to US policy in 2010, were the record floods that occurred there later the same year just an act of nature? Or were other forces in play? Record deluge is also a weapon used by the weathermakers. 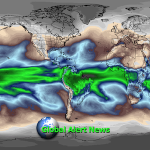 As the planet continues to warm rapidly, deluges will increase. How are things in South America? Certainly we all know how the US power structure is constantly complaining about the BRIC countries. Brazil and Venezuela have been a source of aggravation for our government for a very long time. 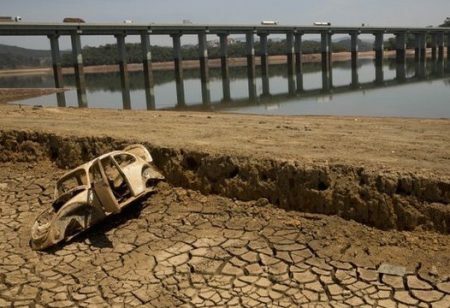 Brazil is experiencing devastating record drought, and yes, so is Venezuela. 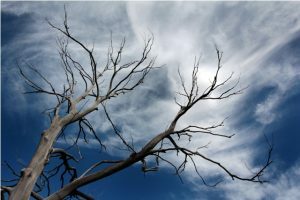 I could go on and on about the countries that have been victims of the US/NATO weather warfare juggernaut of biosphere destruction, but let's now consider the catastrophic and unprecedented drought being engineered in the US West, should we ask ourselves what agendas are now being carried out on the US population? The laws of physics make clear that a warming world should bring more rain overall, the atmosphere can carry 7% more moisture for every degree of additional warming. 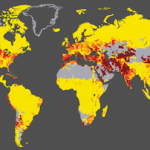 Why is there so much drought in so many countries around the world when the laws of physics state there should be more overall rainfall on a warming planet, not less? 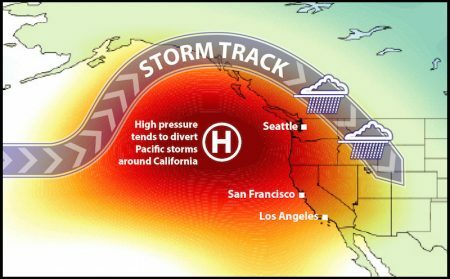 Now it seems that the power structure is sending us the message that they know the drought in the US West is only going to get worse. 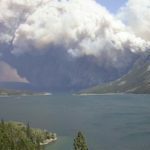 In fact NASA has recently stated on the record that the western US states can expect "megadroughts" in the coming decades, how do they know this? 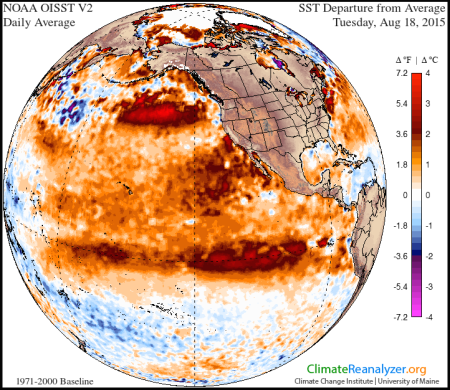 NOAA (National Oceanic and Atmospheric Administration) has recently stated that even with a potential record el nino event, there will be no relief for the completely parched state of California. Since when does El Niño not bring more rain to the West? How does NOAA know this? 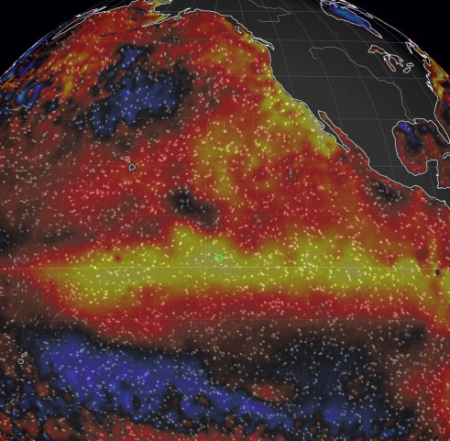 The heat and drought in California has destroyed all previous records. Was the founding of the USofA a masterminded plot by surreptitious interests to eventually create a new economic and militarily weaponized tool in the war for the ultimate control of humanity? I’ve often thought this was the case having learned so much about the derivation of the so called founding precepts that seemingly spawned the US Declaration of Independence and later Constitution. Not much was really original thought in the words of the founding fathers, as “righteous” as they may seem. 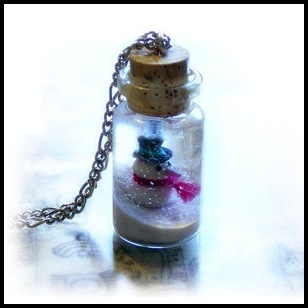 These were universal ideas since the time of ancient Greece, later honed by European intellectuals. 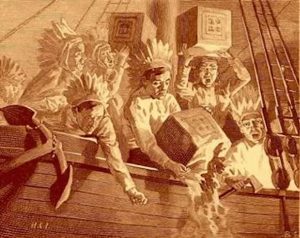 Furthermore, was the Boston Tea Party simply another staged event to galvanize public opinion, both then and for future generations of myth manipulators? 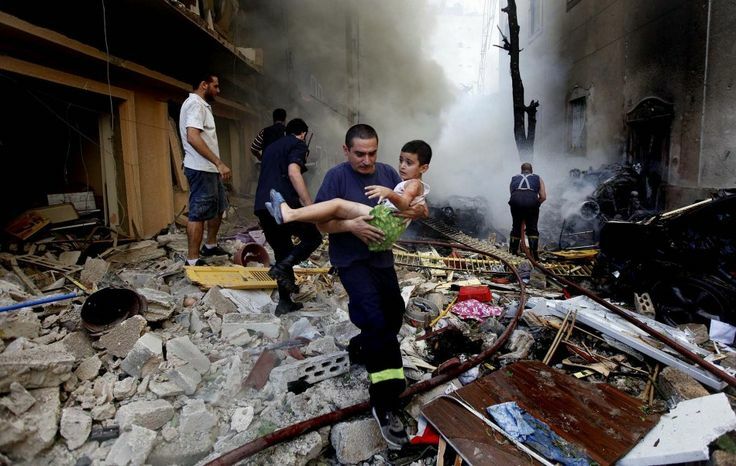 Just look at the end result – by far the most oppressive and warring nation in the history of mankind. An illusion of freedom for which its willing participants would proudly fight and die. 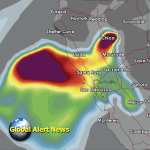 California's water supply is being completely blockaded by a "ridiculously resilient ridge" of high pressure and the constant aerosol spraying of the skies over the once golden state. 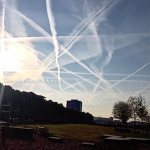 Both factors are a part of the ongoing global climate engineering/weather warfare programs. 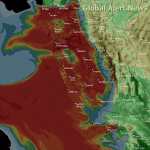 Is California just a "climate sacrifice zone"? 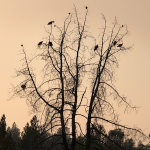 Or a target for catastrophic drought creation to provide governmental powers the premise to take control of water rights and for other purposes of control and profit? The likely answer is all the above. 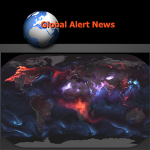 The entire country and indeed the entire planet are under an all out weather warfare and biological warfare assault, this has been the case for a very long time (since the elements being sprayed are highly toxic, the biological contamination must be considered an aspect of these programs). 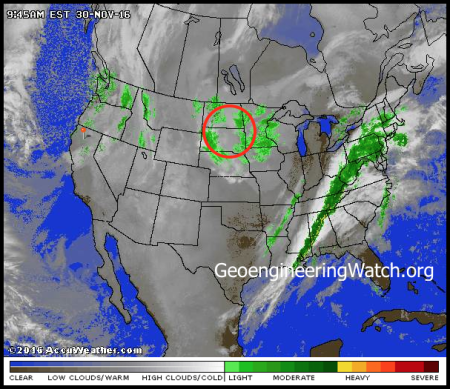 The geoengineers control the skies, rain will not return for the West unless or until the weather makers allow it. 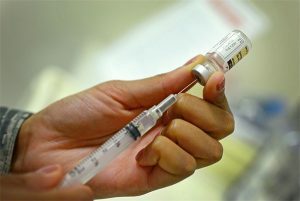 How bad is the situation in California? 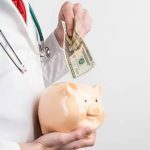 The article below penned by James Lee from TABU is an excellent summary. 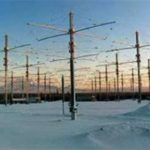 There is a mountain of data including already conducted experiments, satellite imagery, lab tests of snow, observations on the ground, and multiple existing patents, all of which point solidly to the conclusion that snow storms are being engineered on a massive scale with well established weather modification processes. 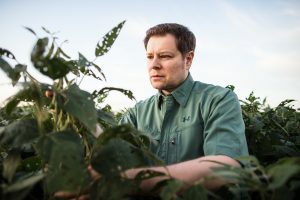 Two known patents for the process of "artificial ice nucliation for weather modification" are posted at the bottom of this article. 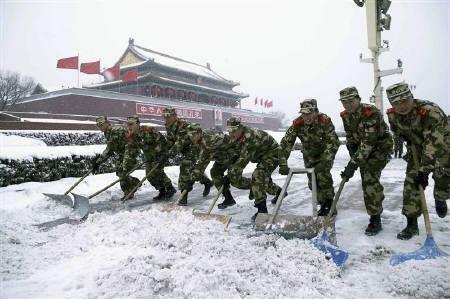 The Chinese government has openly admitted they are creating "artificial snow storms" but later backtracked after causing a billion dollars of damage to Beijing. How long can the climate engineers confuse and divide the US population with completely manipulated "winter storms"? 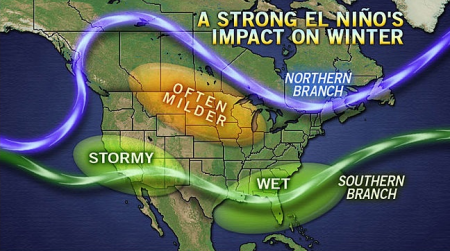 The latest is "winter storm Eris" as named by the power structure owned Weather Channel. Also controlling the flow of climate information to the public is the Rothschilds owned Weather Central. 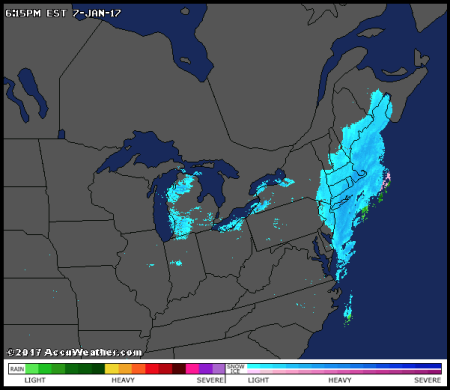 Artificially/chemically nucleated snow is a primary method by which the weather makers create short term toxic cool-downs. Why are they doing this? Because it creates the headlines that the power structure and its media machine need to help hide the fact that our planet is warming at a runaway pace. 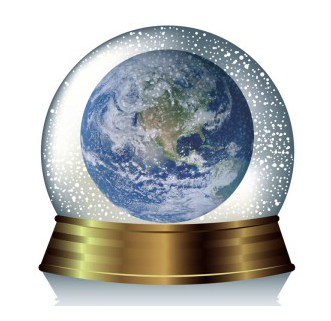 A "white Christmas" here and there does much to confuse the public as to what is actually unfolding on the bigger climate picture. 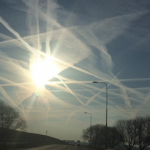 This is one of the major purposes of global geoengineering. 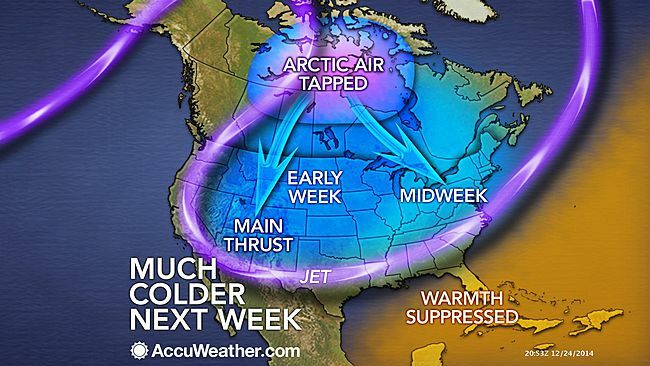 Extreme jet stream manipulation is a major component of the engineered cool-down of the US. 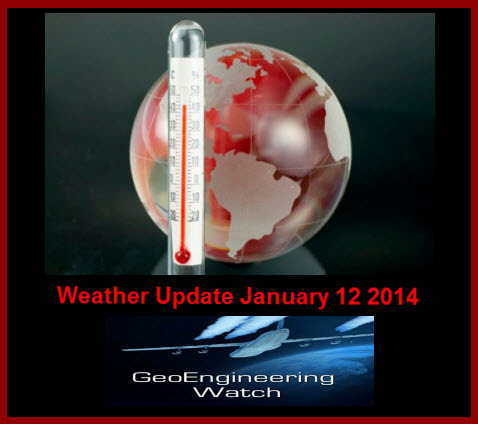 The geoengineers are going for broke with the latest all out engineered cool-down of the US. 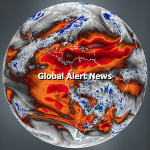 Their Rothschild owned Weather Channel theater and its cast of actors are trumpeting the “freezing planet” headlines, but what is going on with the climate in the rest of the world? The eastern half of the lower 48 states in the US is only 1/2 of a percent of the total surface area of the planet. If that’s only 1/200th of the total surface area, whatever is happening there certainly does not reveal the bigger global picture. Unfortunately, many that live in these “engineered cool-down” zones and many who only watch the corporate controlled media have completely taken the bait. So what is the larger global picture? The just released article below will shed some light on this question. 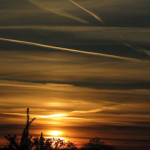 Though the publication below of course does not mention the climate engineering elephant in the room, it does give clear and verifiable facts on the bigger picture. 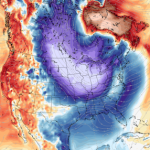 How is it there are such anomalous cold events on an ever rapidly warming planet? 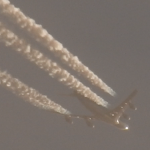 Welcome to climate engineering and "artificial ice nucleation for weather modification". 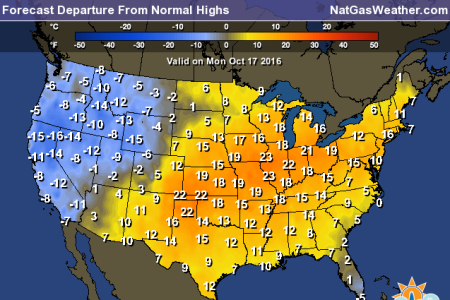 The geoengineers were able to manipulate some weather headlines and produce a few cold records in the Eastern US just before the end of October, 2014, with what they labeled as the "polar blast"(the constant record heat in so many parts of the planet are generally ignored by mainstream media). 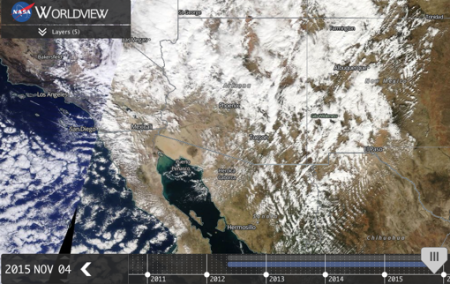 Engineered snow storms are a major part of the ongoing climate engineering assault on our biosphere. 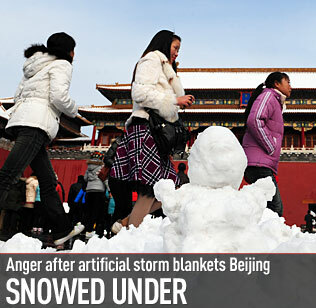 Massive fluctuations of temperatures and conditions accompany such unnatural events. 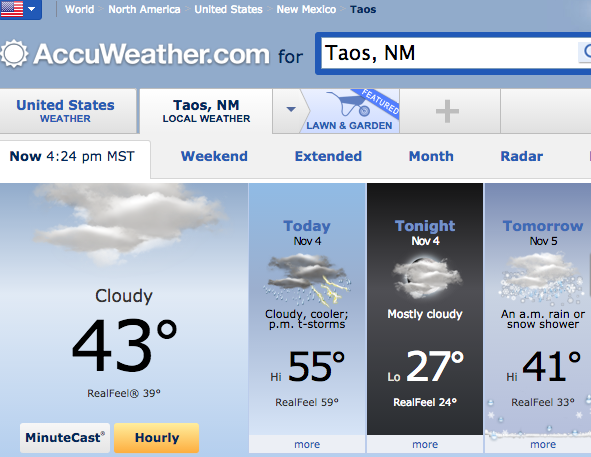 There is no longer any "natural" weather, none. Surreal photos from Slovenia's Worst Ice Storm In History (though mainstream media tried to make it seem as if such an event had happened before by saying it was the worst "in living memory", statistically it was an unprecedented event). I was contacted by people from Slovenia who made it completely clear that they believed this ice cataclysm was the result of weather warfare, punishment for resistance to outside political pressures. 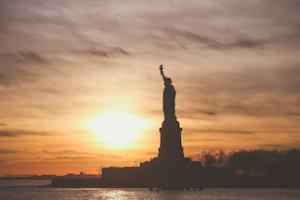 The control of the US, and of global politics, by the wealthiest families of the planet is exercised in a powerful, profound and clandestine manner. 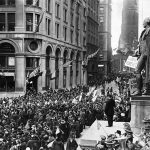 This control began in Europe and has a continuity that can be traced back to the time when the bankers discovered it was more profitable to give loans to governments than to needy individuals. Amazingly enough, most people don’t know that the Federal Reserve Bank is a private institution. 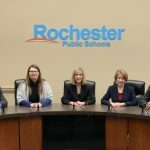 It’s so private that despite its profound influence and power, no one is allowed to know who the board of directors are or any of its inner workings. Yet they control not just the production and flow of money in America, but the economic mechanisms that drive the US economy and thus much of the rest of the world. 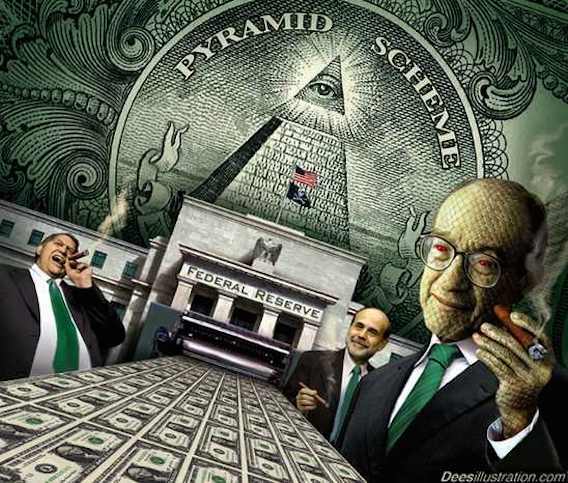 If the American people truly understood how the Federal Reserve system works and what it has done to us, they would be screaming for it to be abolished immediately. 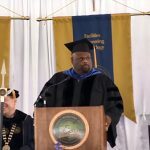 It is a system that was designed by international bankers for the benefit of international bankers, and it is systematically impoverishing the American people. The Federal Reserve system is the primary reason why our currency has declined in value by well over 95 percent and our national debt has gotten more than 5000 times larger over the past 100 years. The Fed creates our “booms” and our “busts”, and they have done an absolutely miserable job of managing our economy. 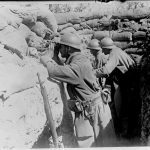 There have been many wars — terrible wars — fought on Planet Earth over the past 100 years. However, the greatest war of them all could literally around the corner, unless it is stopped by the people of this planet. The epic confrontation in the Ukraine presents the most dangerous and unprecedented conflict between the world’s superpowers since the breakup of the Soviet Union. Truly, this clash between East and West represents an economic, political and religious battleground that will dwarf every other war save WWI and WWII. If the conflict in the Ukraine is not resolved peacefully, it has the potential of evolving into a full blown World War III scenario. 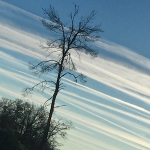 Since November of 2013, the beginning of the rainfall season, California residents have experienced heavy geoengineering and chemtrail activity almost every day, which has transformed the Golden State, normally an agricultural miracle, into an arid dust bowl. 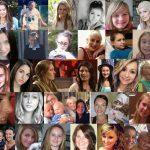 Events such as global warming and epidemic cancers, Alzheimer’s disease, autism, obesity, diabetes, asthma, COPD, strokes and heart disease have had credibility problems from their mass-media inception. 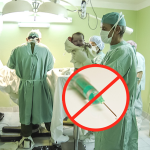 Anyone over the age of 60 who remembers standard health during the early and mid-twentieth century knows that human health has made a wild U-turn beginning around 1970, and what we know is that ill-health, which did not rule former days, is today all but guaranteed. Today, good health is rare and may, in fact, be impossible without extraordinary, very exclusive and scientific secrets. 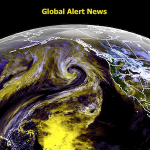 by William Thomas The anticipated Big Blow came unexpectedly in late October 2012, when a late-season tropical storm picked up enough energy from an unusually warm Atlantic Ocean to maintain hurricane intensity as it tracked north. 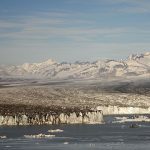 Blocked from recurving eastwards by the Greenland High, Sandy “did something never observed before in records going back to 1851 – it took a sharp turn to the west and headed toward the most populated area along the eastern seaboard,” scientists said. 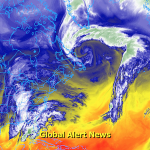 Invigorated by cold air deflected south from the Arctic, Sandy morphed into “a monster hybrid storm” with “the lowest atmospheric pressures ever recorded” for any storm making landfall north of Cape Hatteras. Instead of snow, Sandy unleashed rain of monsoon intensity.